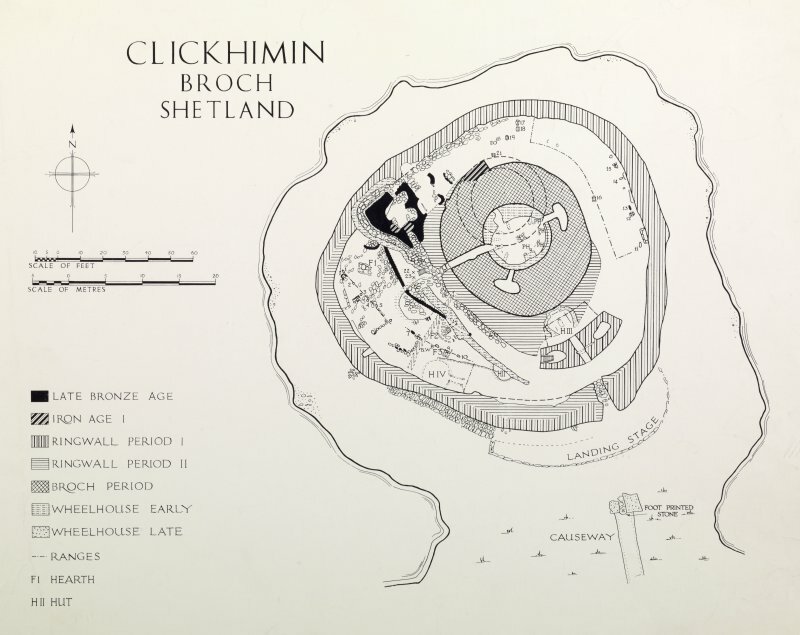 Publication figure; Master plan of Clickhimin broch, Shetland. Photographic copy. 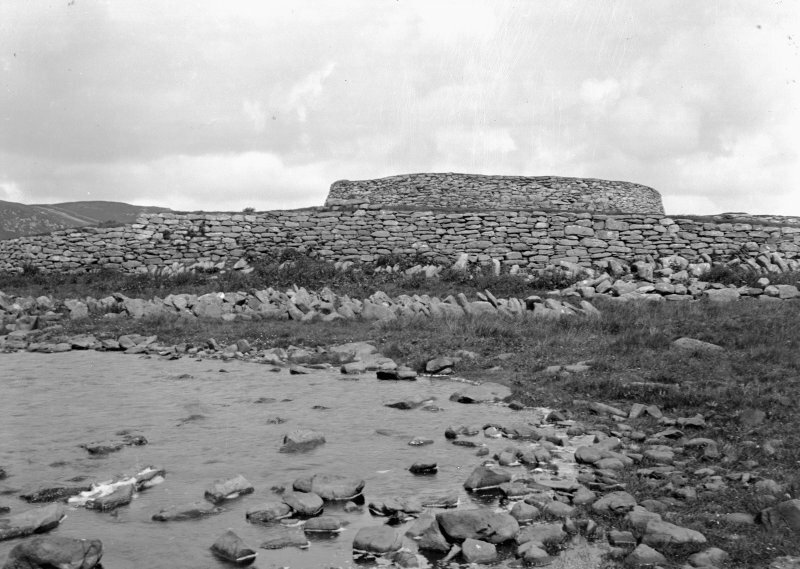 General view of Clickhimin broch. 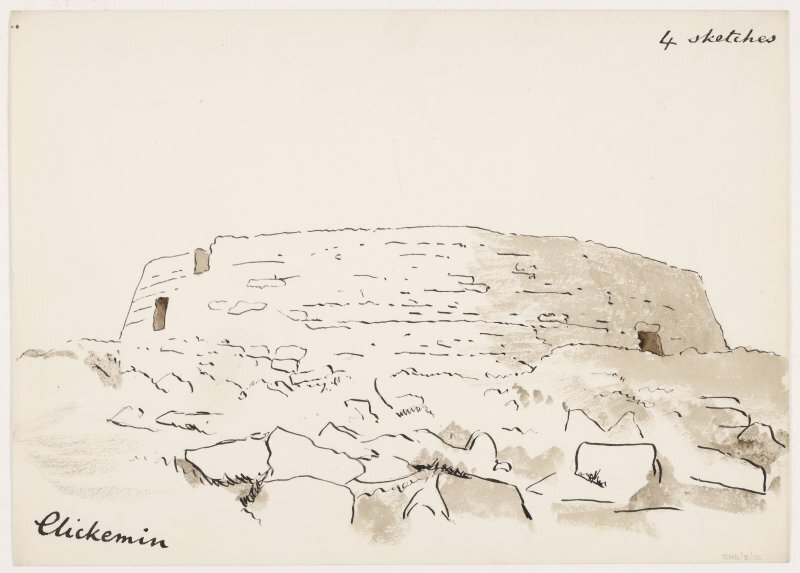 Sketch, settlement remains outside entrance to Clickimin broch. 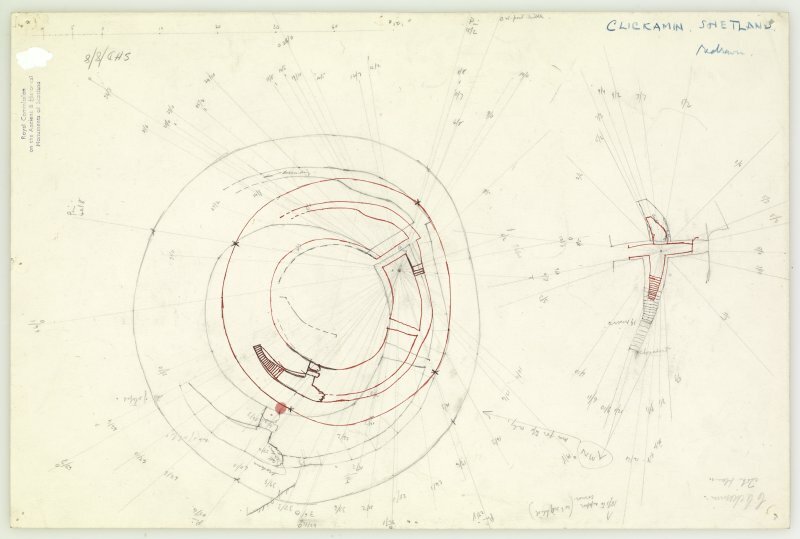 Sketch elevations of the interior of Clickimin broch on the E, S and W, with annotations and measurements. Unsigned and undated but in Dryden's hand. 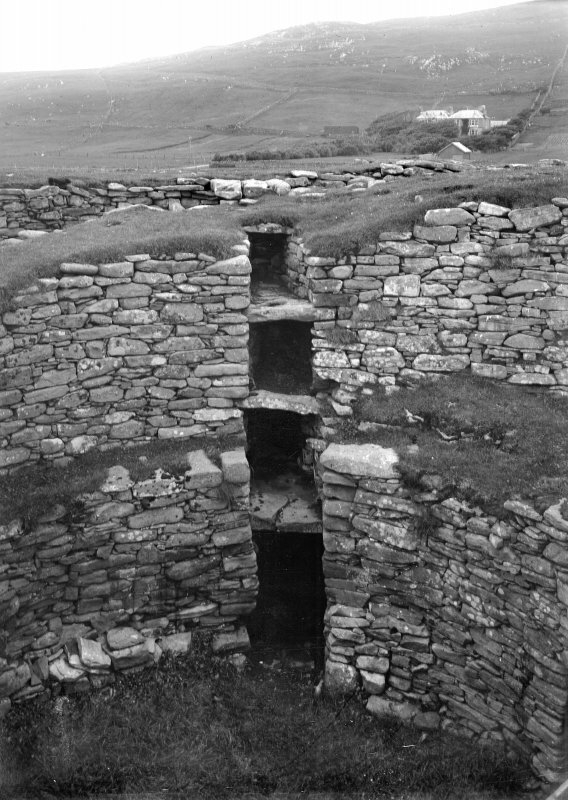 Sections through broch looking NW and SE. 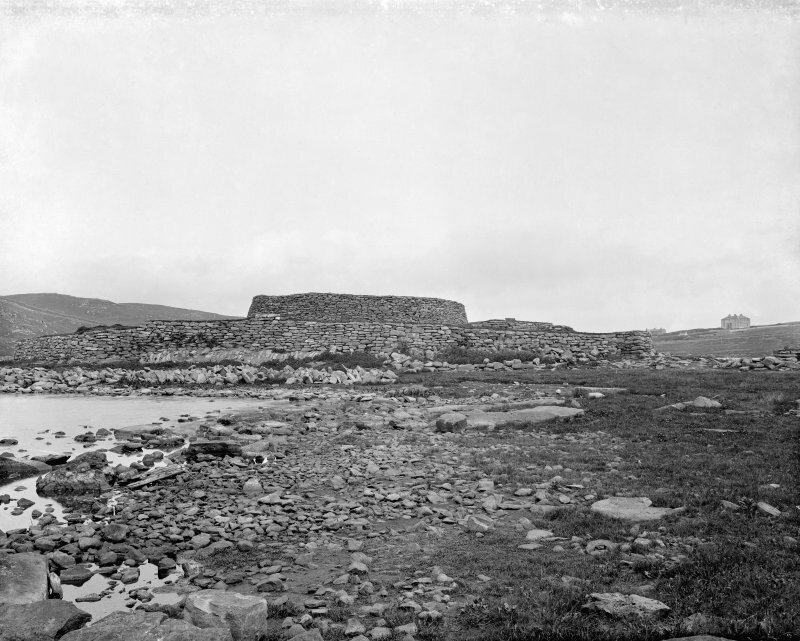 View of Clickimin broch, Lerwick. 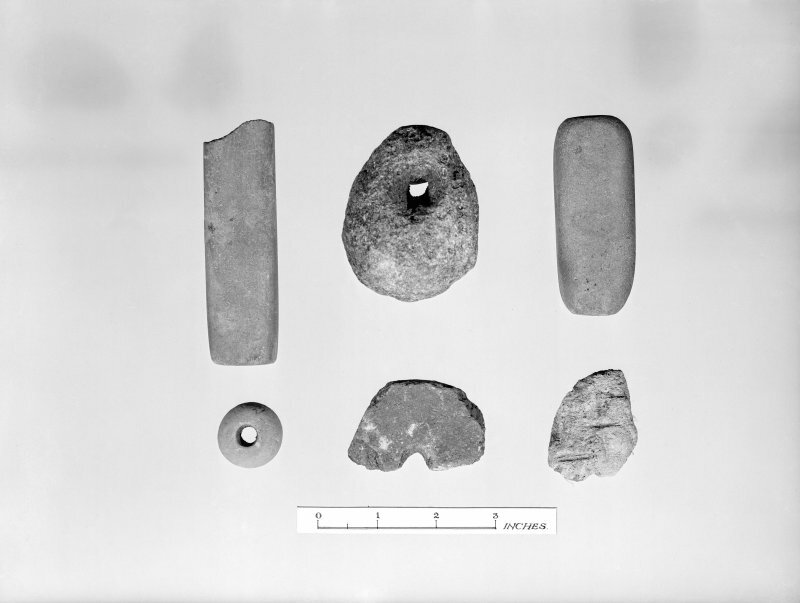 View of artefacts found during 1953 excavation of Clickhimin broch. 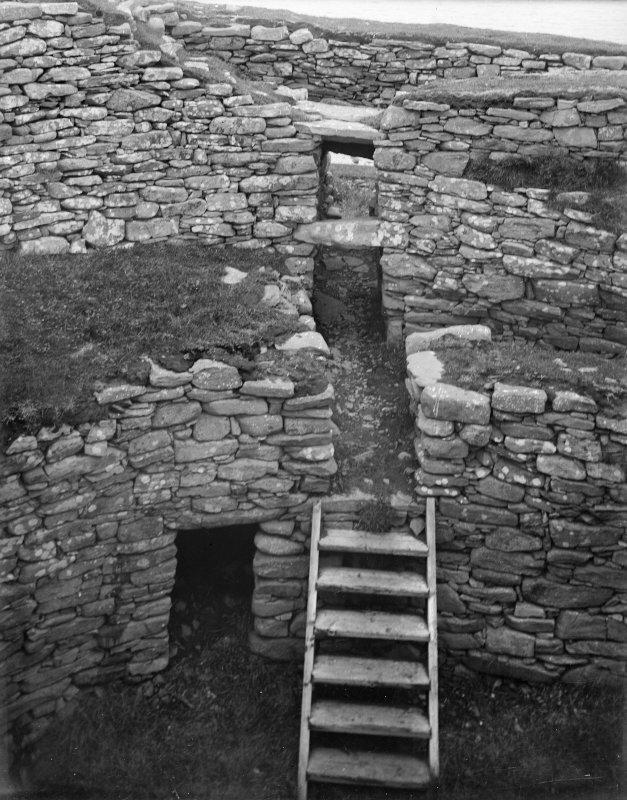 View of intramural staircase, Clickhimin broch. 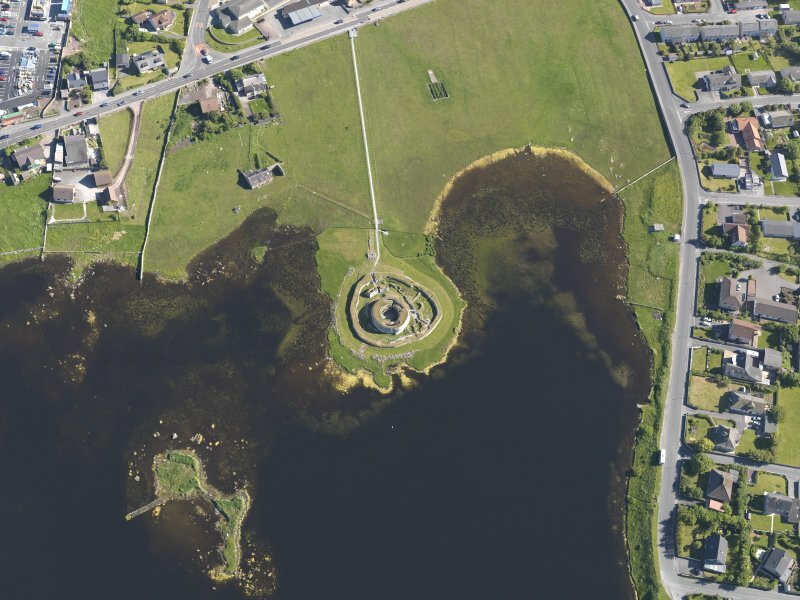 Oblique aerial view centred on the remains of the broch and settlement of Clickhimin, looking WSW. 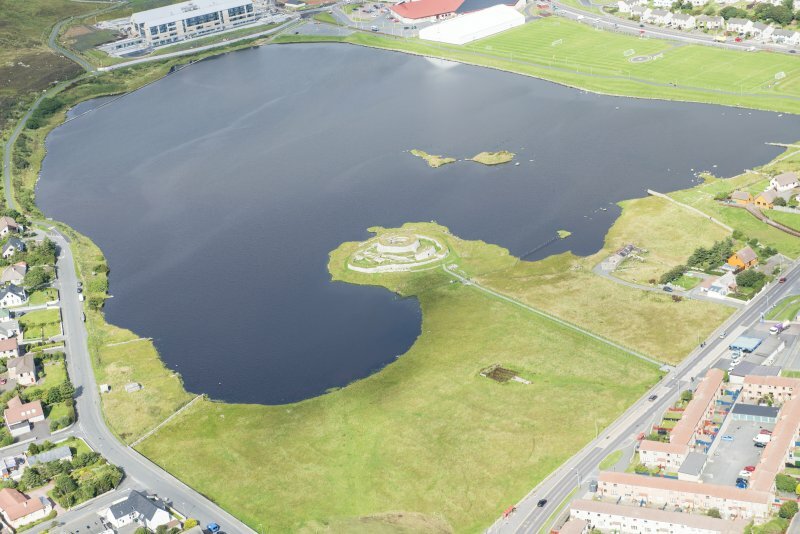 General oblique aerial view of the Loch of Clickimin with the Ness of Sound beyond, looking to the SSE. 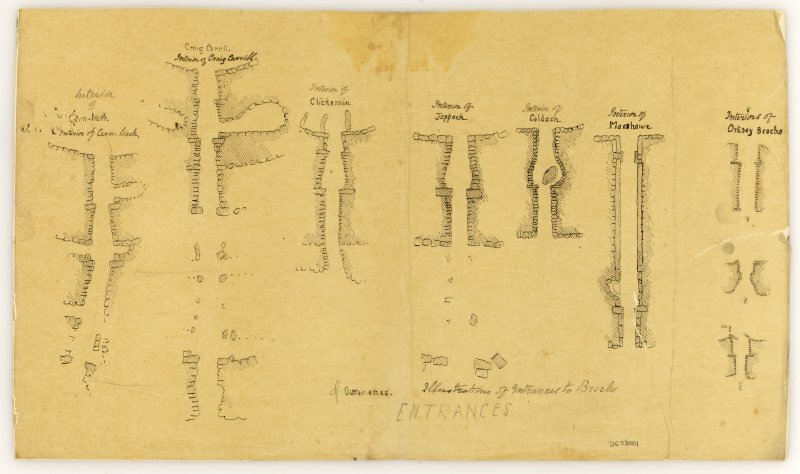 Drawing of foot marks. 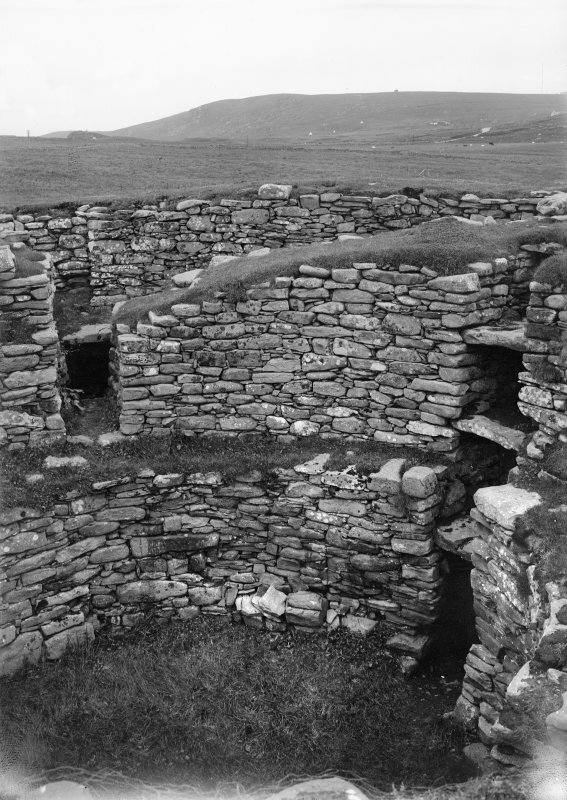 Clickhimin broch, Shetland. 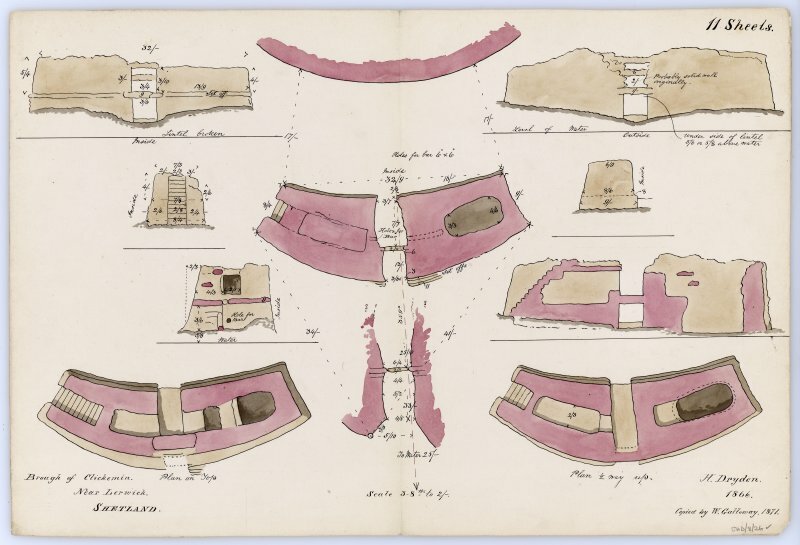 Publication drawing; Broch of Clickhimin, sections. 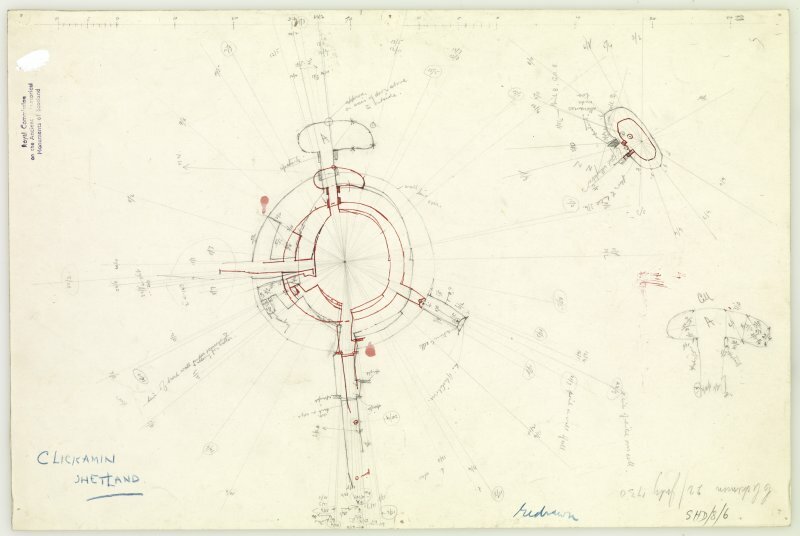 Publication figures; Clickhimin (Royal Commission Survey), plans, based on those produced by RCAHMS in 1930 and published in 1946. 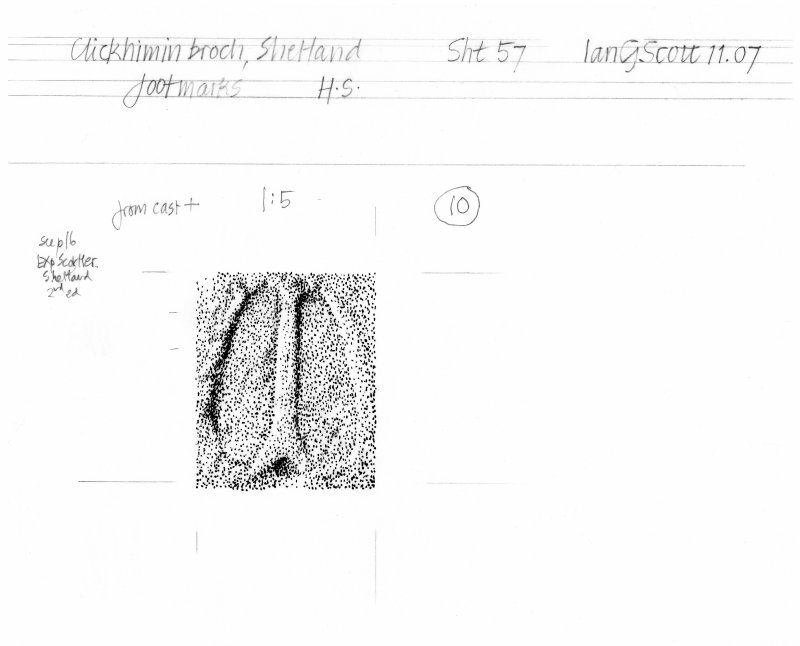 Sketch of Clickimin broch exterior from NE. 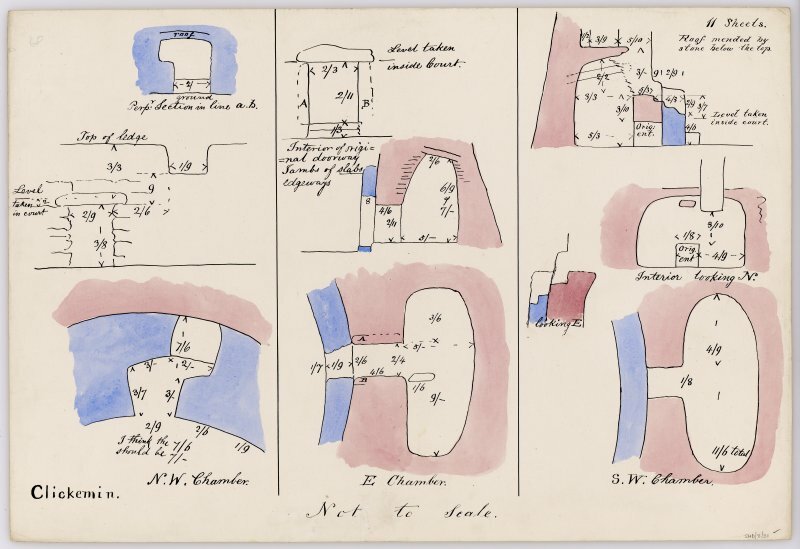 Sketch plans, elevations and sections through the chambers on the NW, E and SW of Clickimin broch, with annotations and measurements. Unsigned and undated but in Dryden's hand. 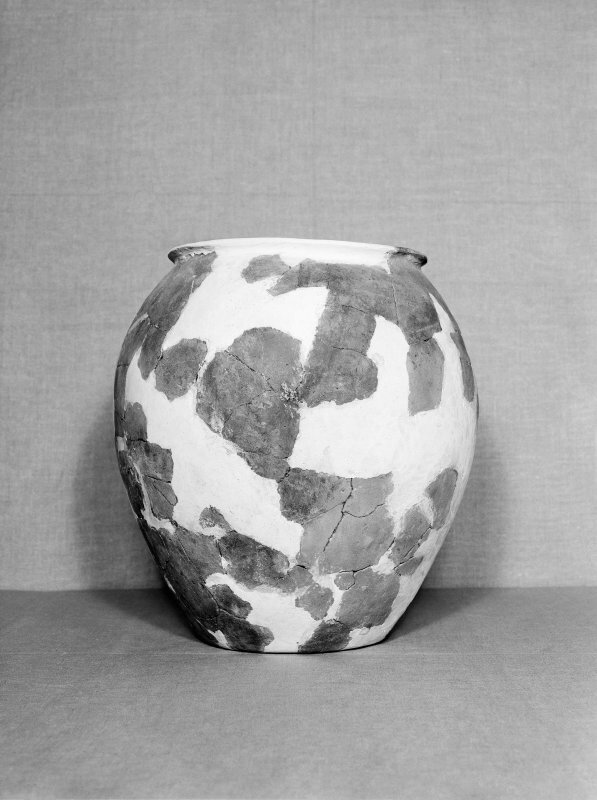 View of pottery vessel reconstructed from sherds found during excavation of Clickhimin broch. 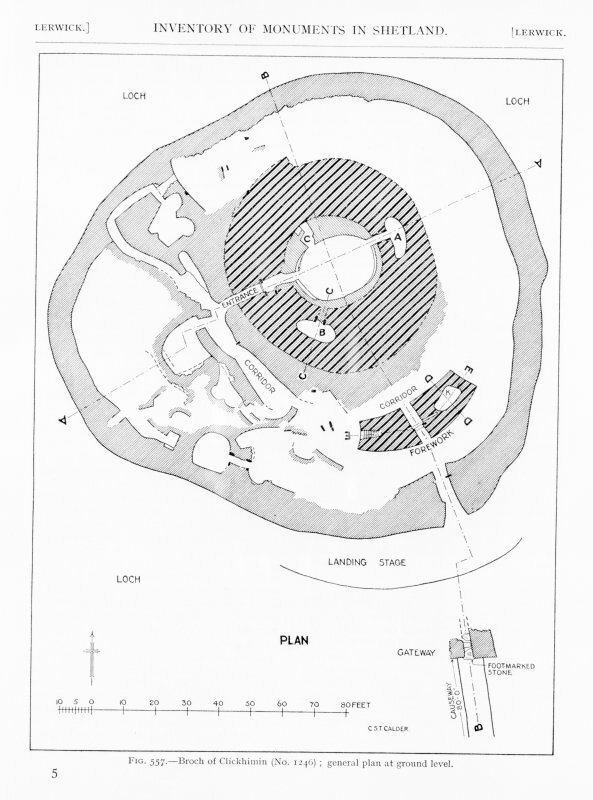 Photographic copy of plan of excavation at Clickhimin broch. 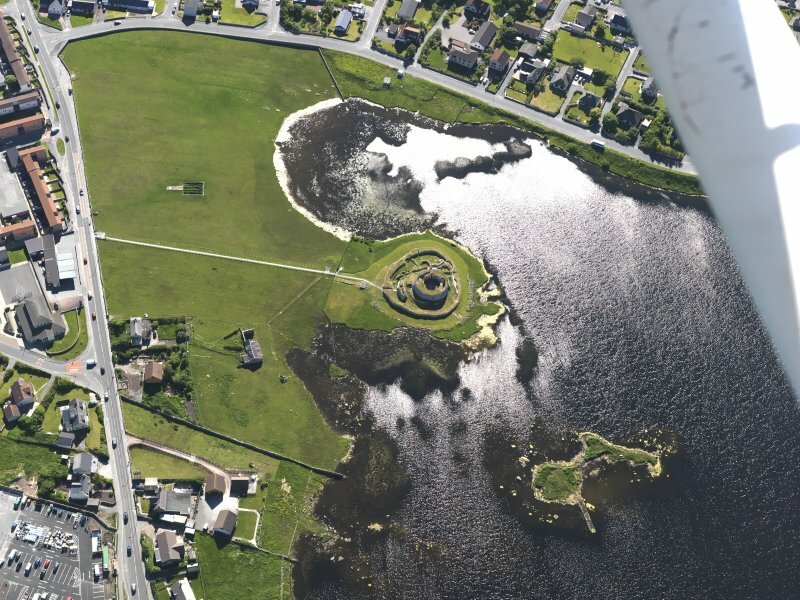 Oblique aerial view centred on the remains of the broch and settlement of Clickhimin, looking SSW. 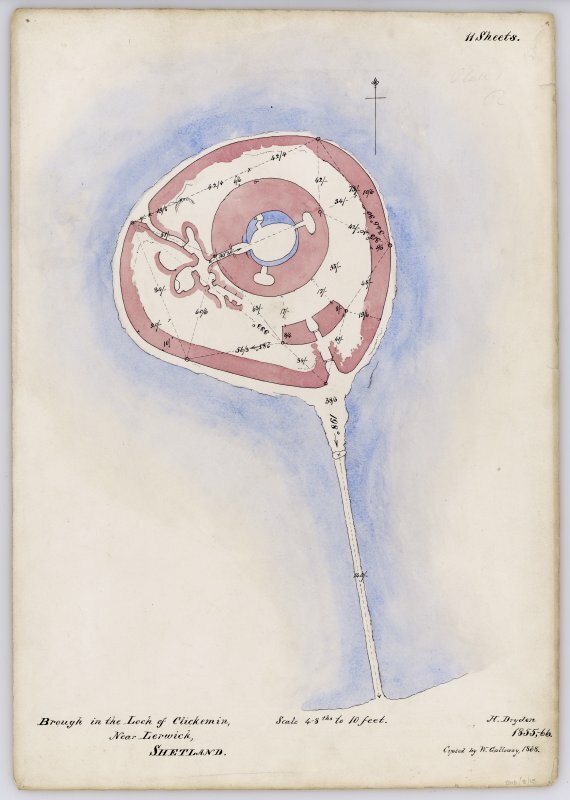 General oblique aerial view of the Loch of Clickimin with the Ness of Sound beyond, looking to the S.
Plan and elevation pen, pencil H.M.MacLeod heavily annotated wash. 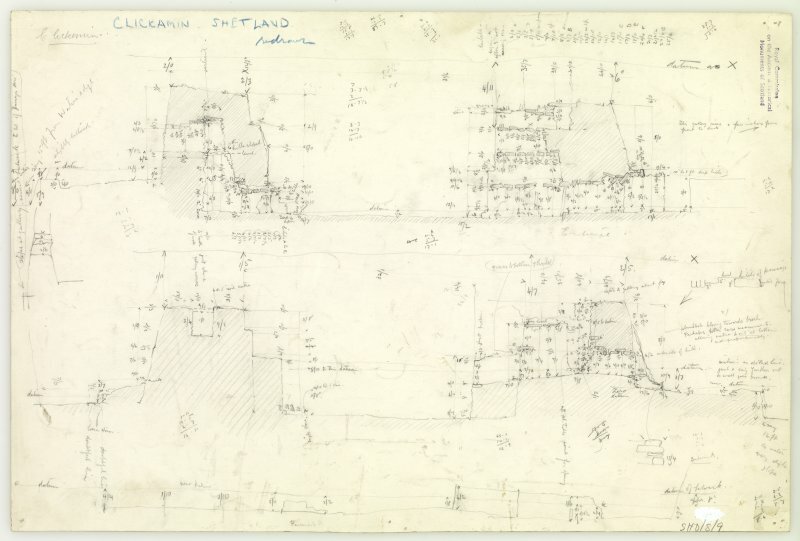 Section through Clickimin broch, looking NW; section through broch looking SE, with annotations and measurements, and indications of levels at which plans were drawn. 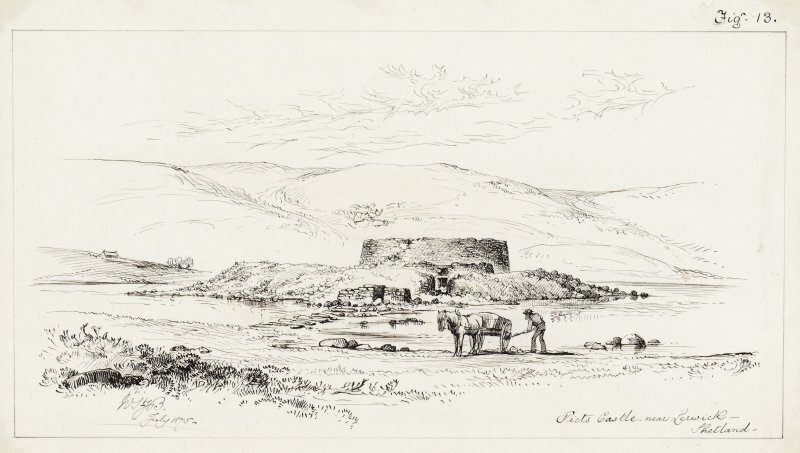 Drawn by Dryden in 1866 and copied by Galloway in 1871. 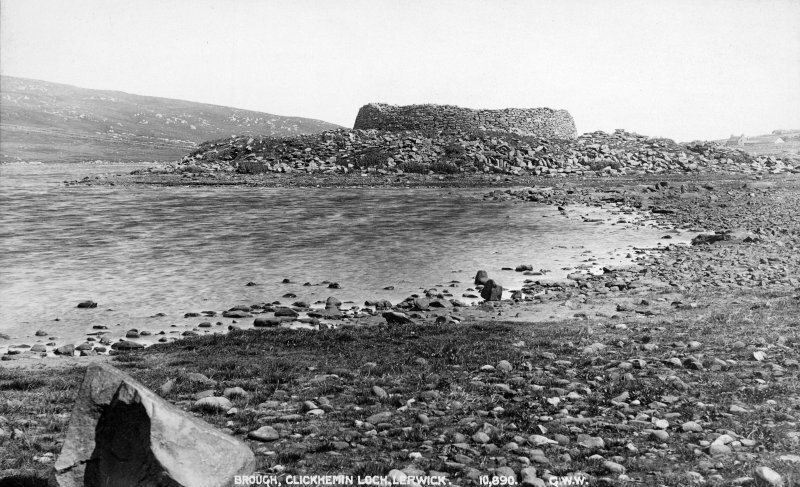 Titled: 'Brough in the Loch of Clickemin. 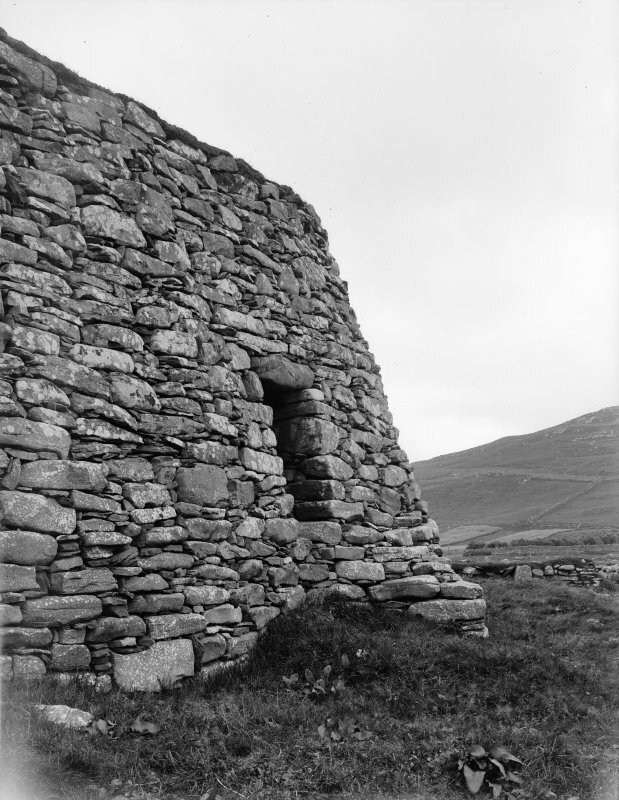 Near Lerwick. 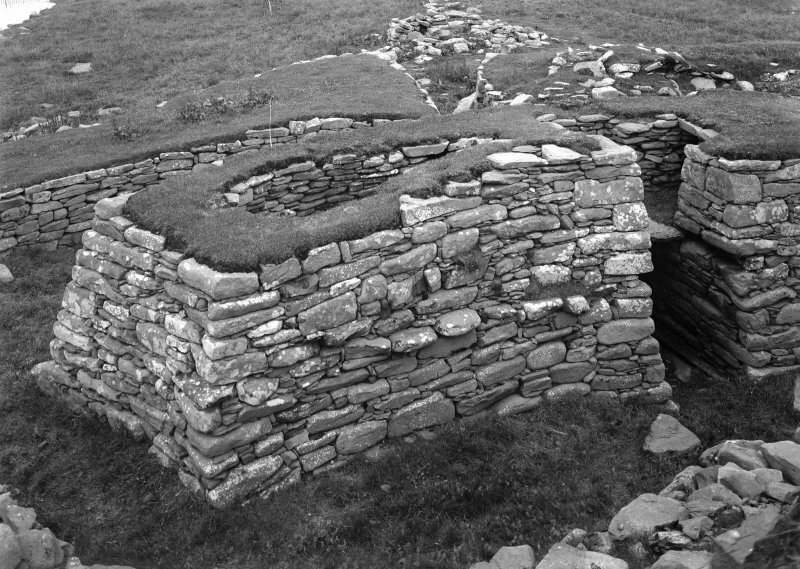 Shetland'. 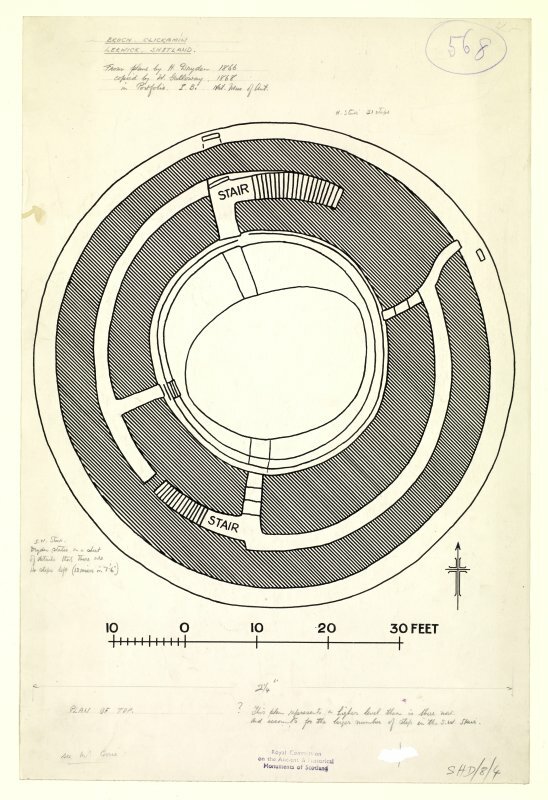 Plan of Clickimin broch at upper level. 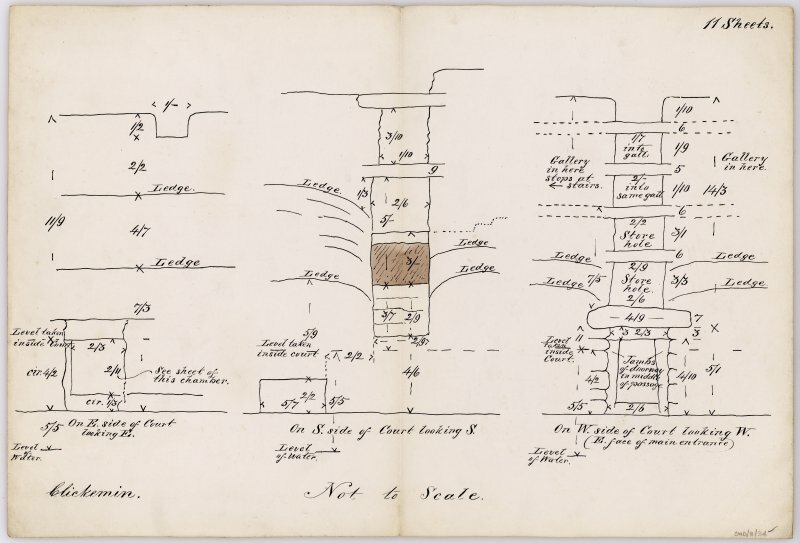 Drawn by Dryden in 1866 and copied by Galloway in 1871. Titled: 'Brugh in the Loch of Clickemin. 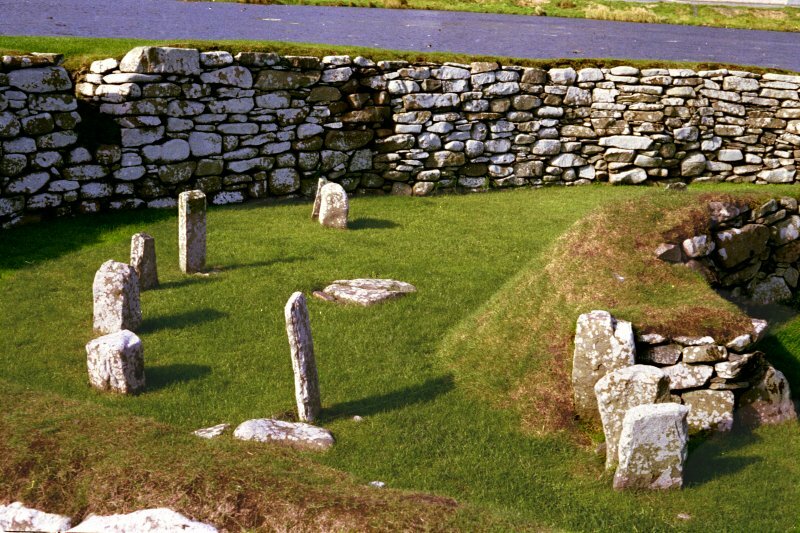 Near Lerwick. Shetland'. 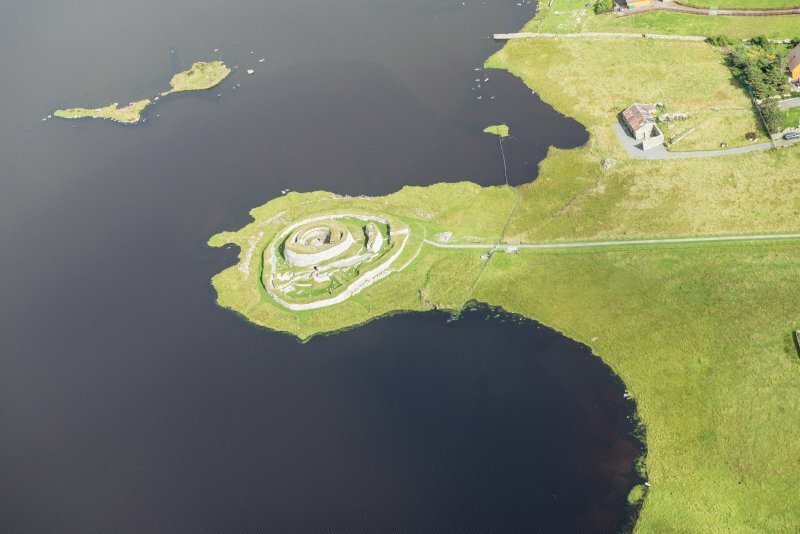 Oblique aerial view of the housing on the W shore of the Loch of Clickhimin with the remains of the broch and settlement of Clickhimin adjacent, looking NE. 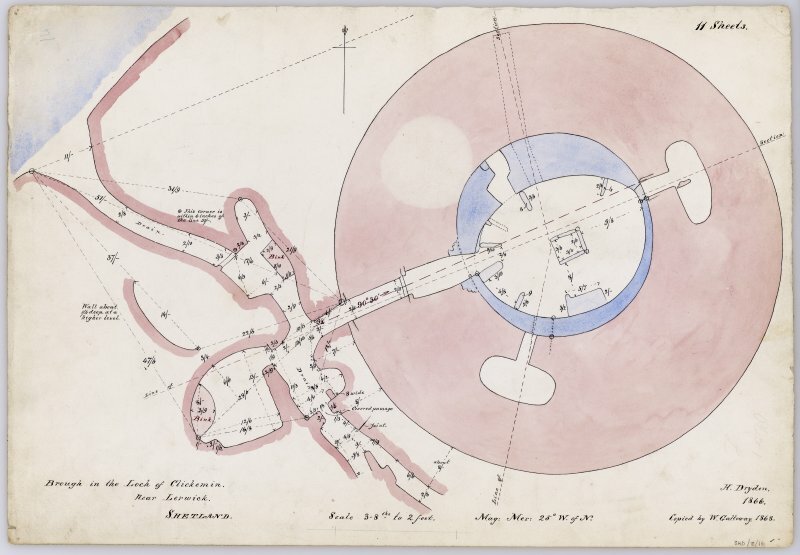 Publication drawing; Broch of Clickhimin, plan at level of gallery, after Dryden. 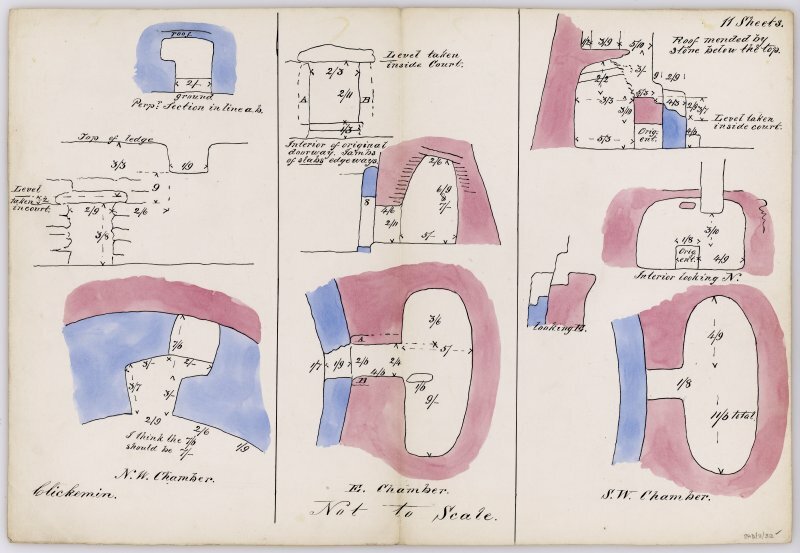 Sketch elevations of the interior of Clickimin broch. 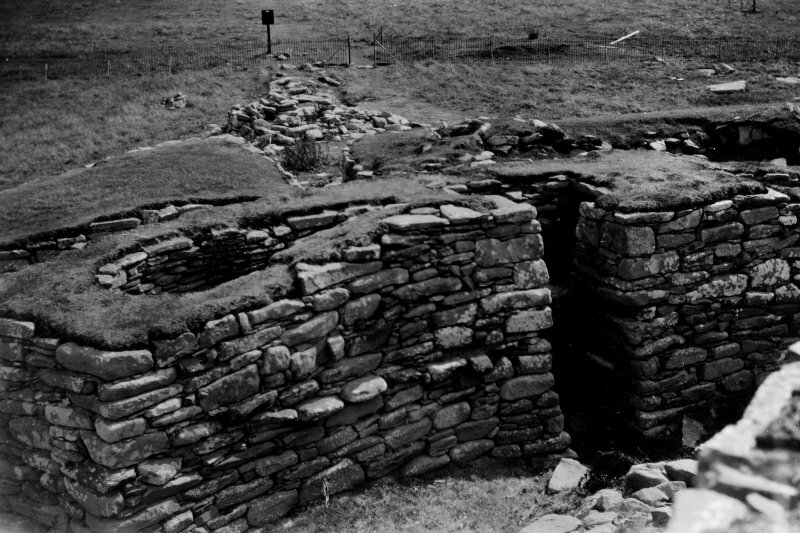 Elevation and section of 'path to water', ie path through outbuildings to NE of Clickimin broch; section of blockhouse looking NE ; section of outworks S of main entrance looking SE; all at scale of 3/8":2'. 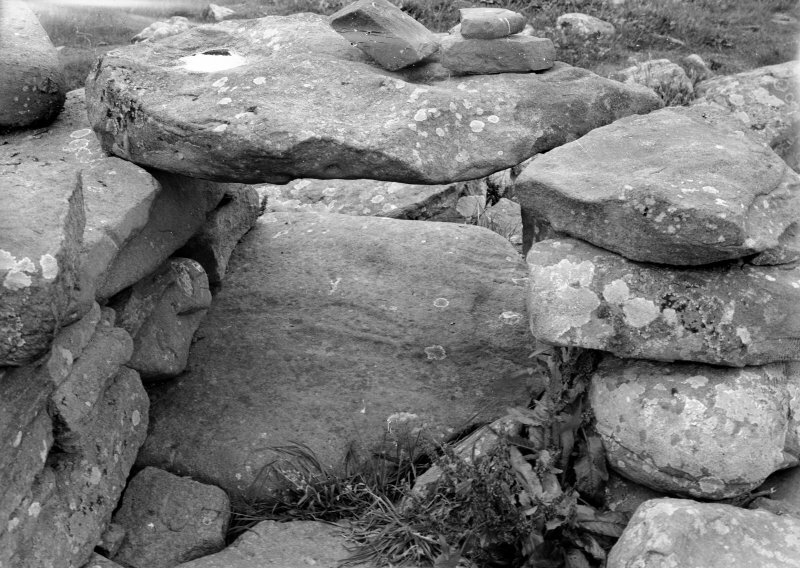 Also section of island and structures looking ESE at scale of 1/2":10'. 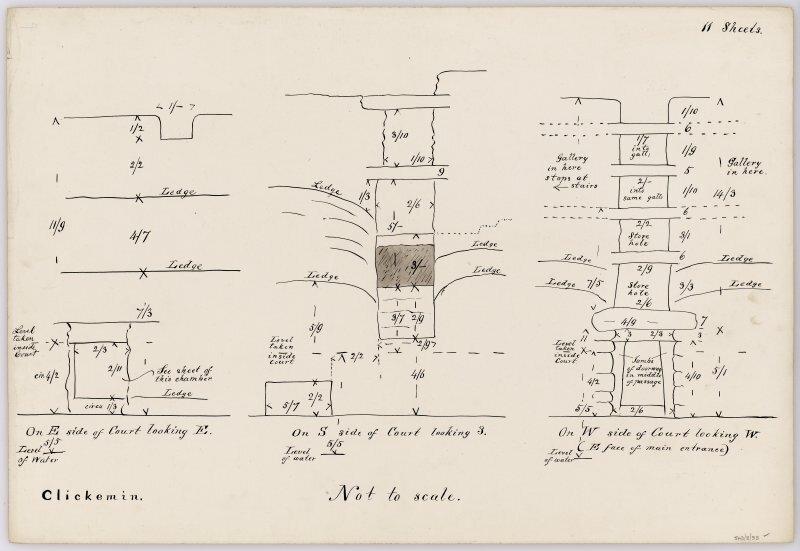 Sketched details of wall exterior on E and N. Insigned and undated but in Dryden's hand. 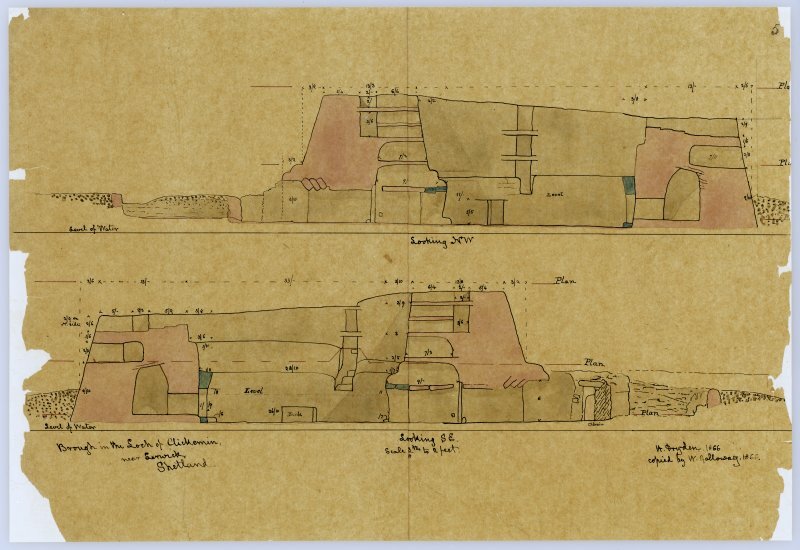 Section through Clickimin broch, looking W; section through broch looking E, with annotations and measurements, and indications of levels at which plans were drawn. 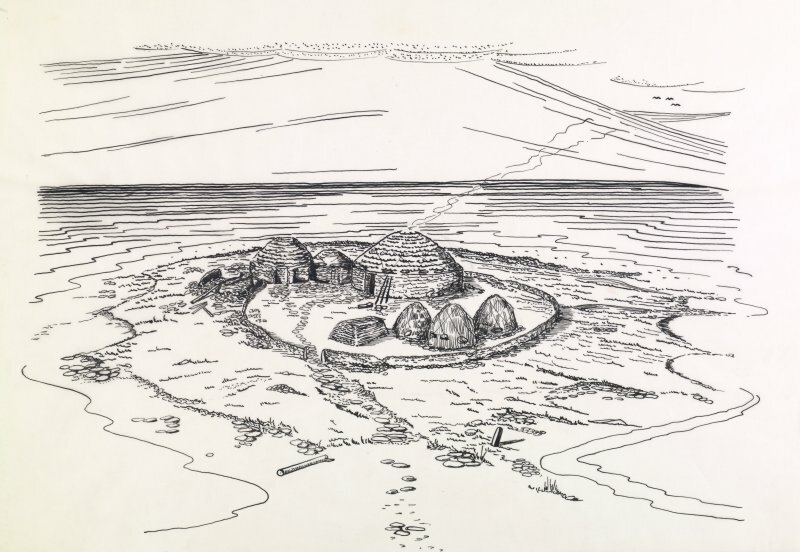 Drawn by Dryden in 1866 and copied by Galloway in 1871. Titled: 'Brough in the Loch of Clickemin. 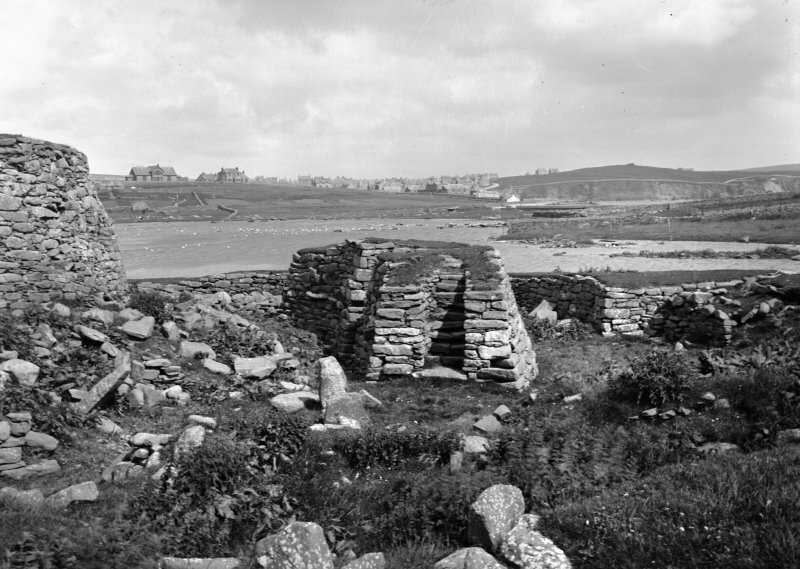 Near Lerwick. Shetland'. 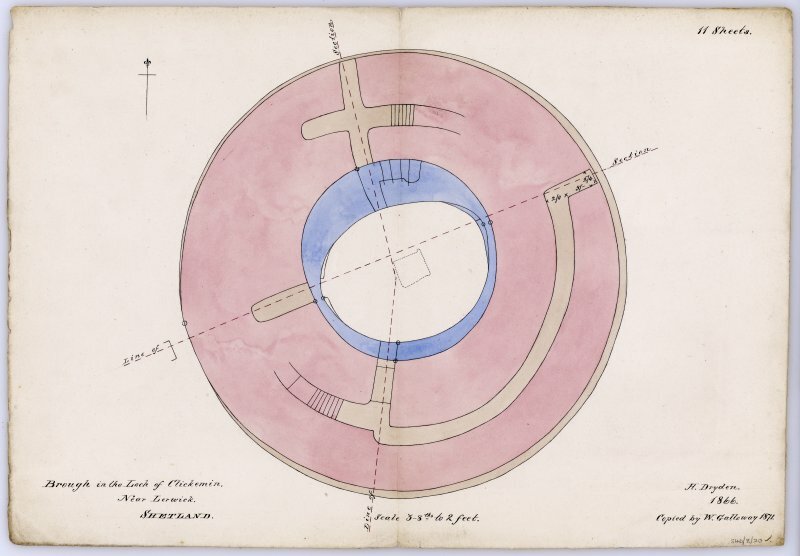 Plan of Clickimin broch and outbuildings to W, with annotations and measurements. 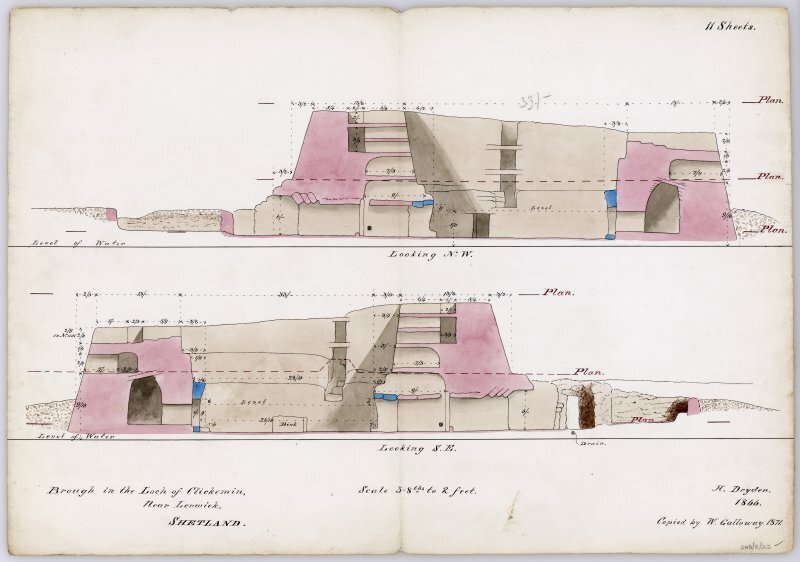 Drawn by Dryden in 1866 and copied by Galloway in 1868. Titled: 'Brough in the Loch of Clickemin. 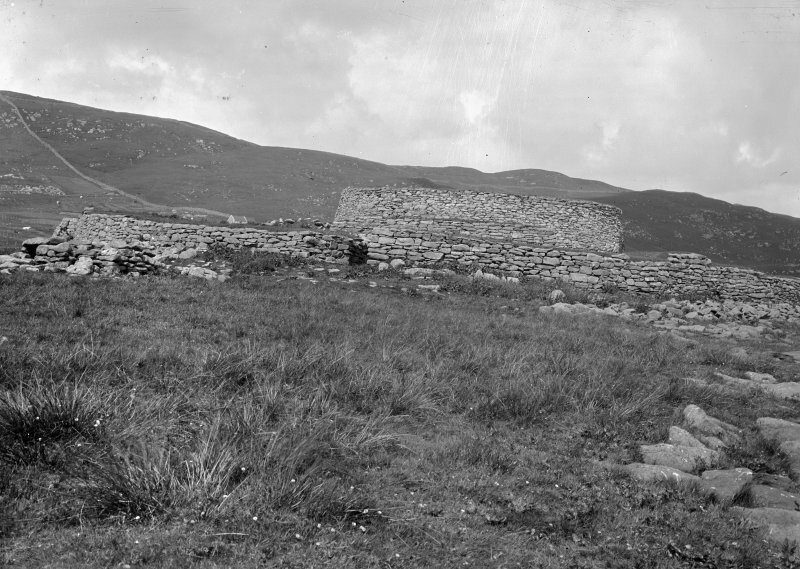 Near Lerwick. 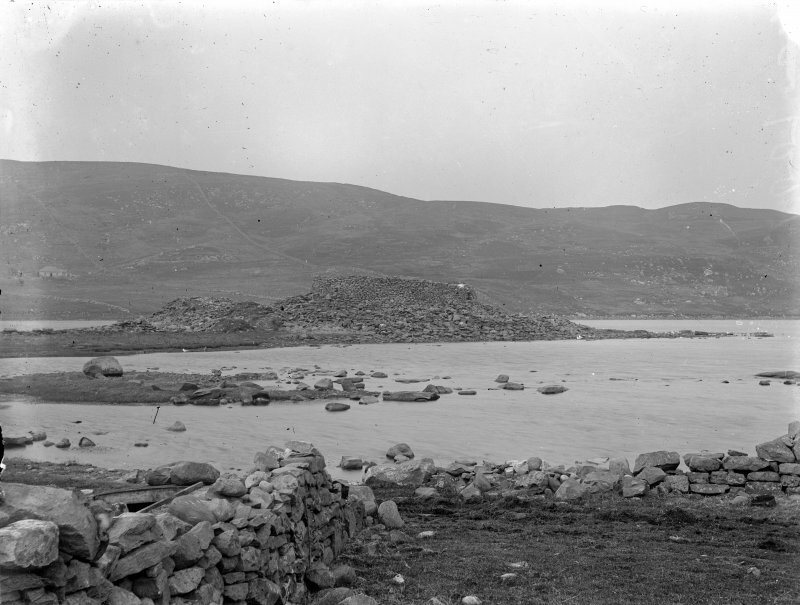 Shetland'. 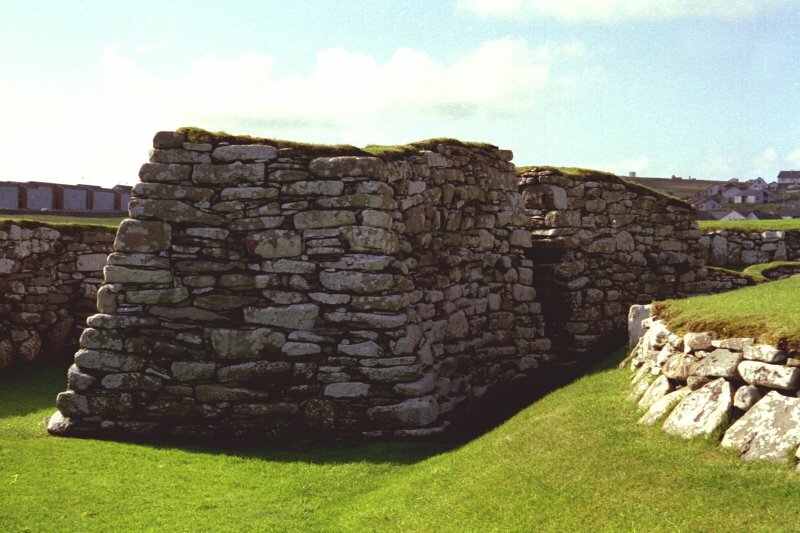 Interior view of Clickhimin broch. 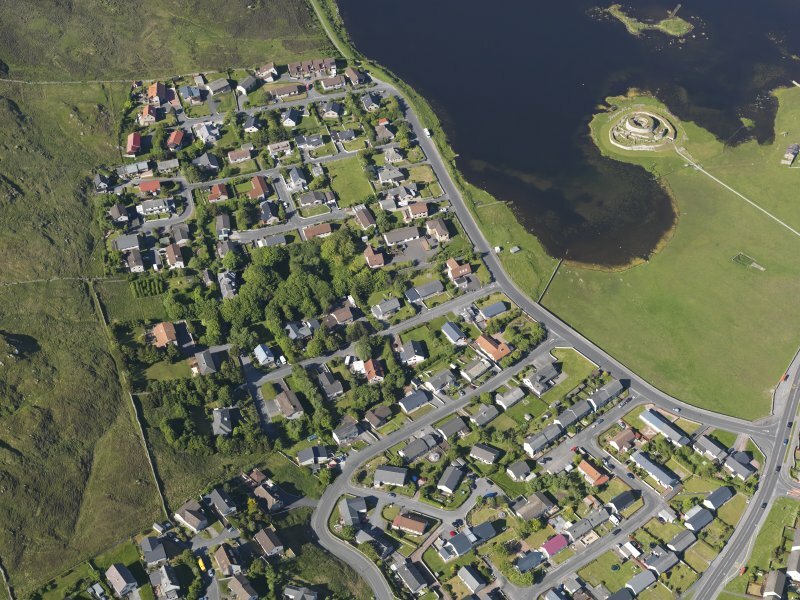 Oblique aerial view centred on the remains of the broch and settlement of Clickhimin, looking SSE. 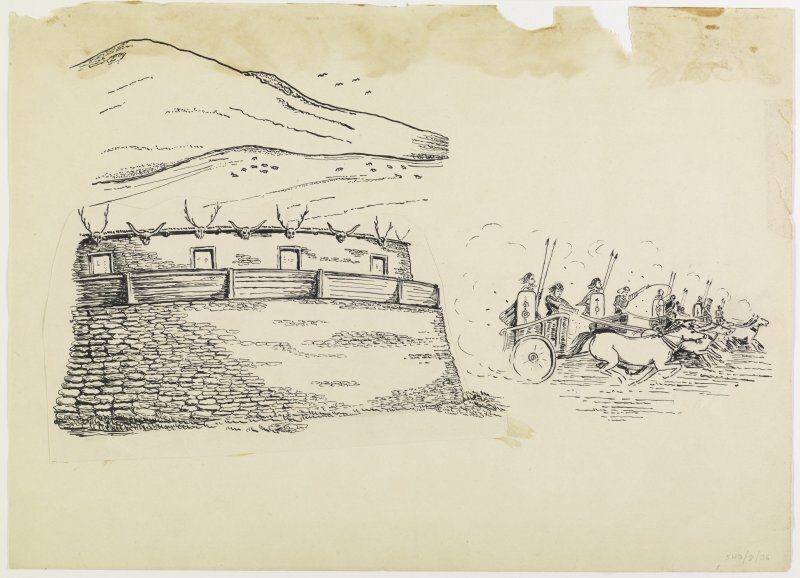 Inked drawing apparently showing a reconstruction of Clickhimin or a related site. 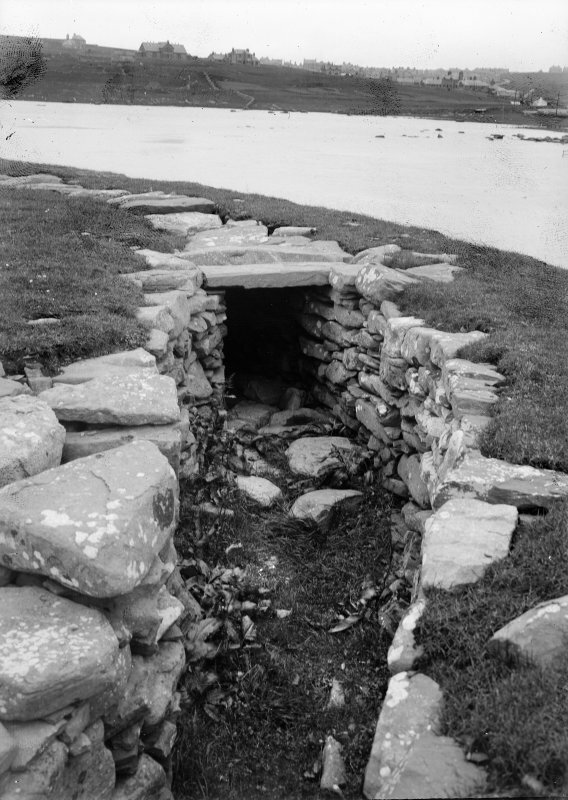 Publication figure; Calf of Eday, Orkney. 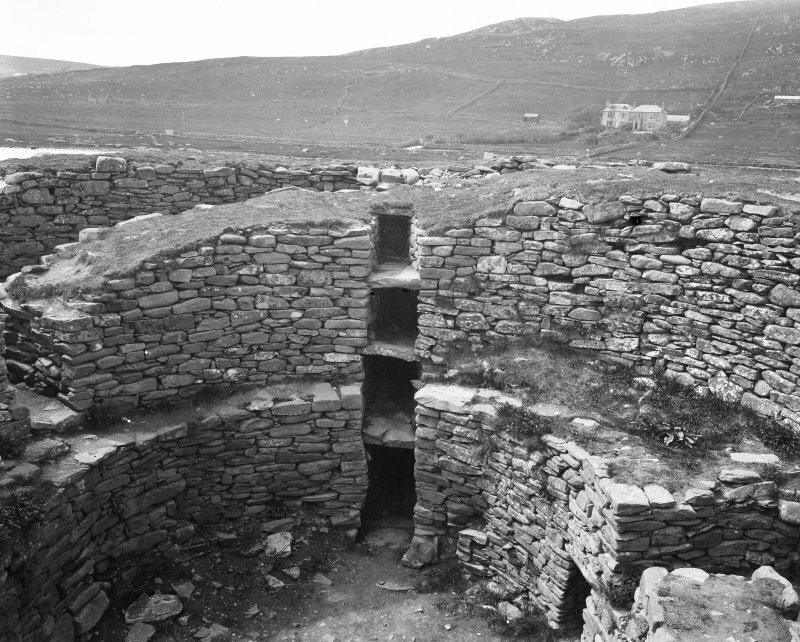 Iron Age Dwelling. 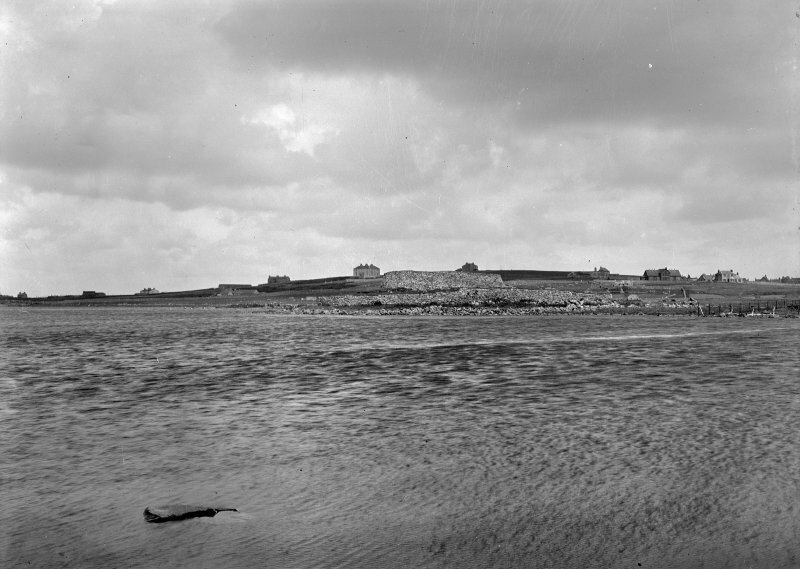 After RCAHMS 1946, v2, 68. Photographic copy. 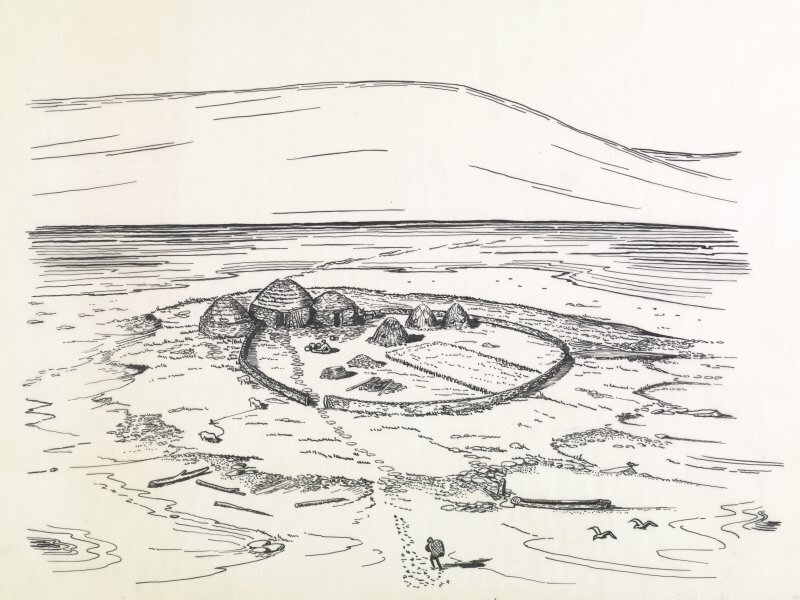 Publication figure; draft reconstruction of a Early Iron Age farmstead at Clickhimin. 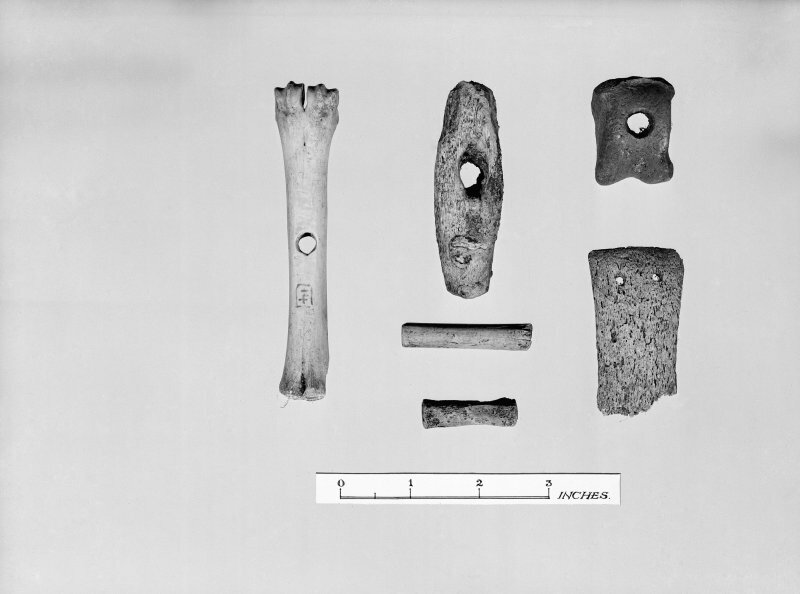 See Hamilton 1968, Fig. 15, for final version. 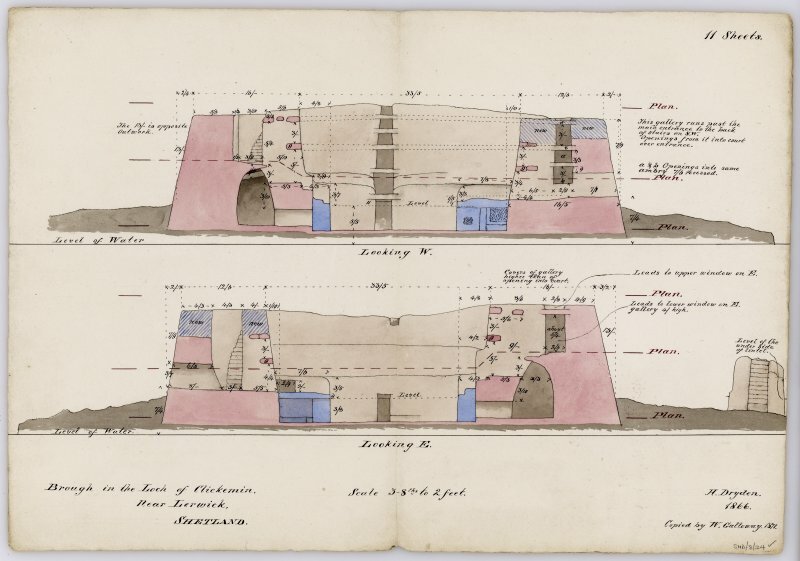 Plans at ground level, midway up and top level of blockhouse; ground level plan in relation to broch wall and fort entrance. 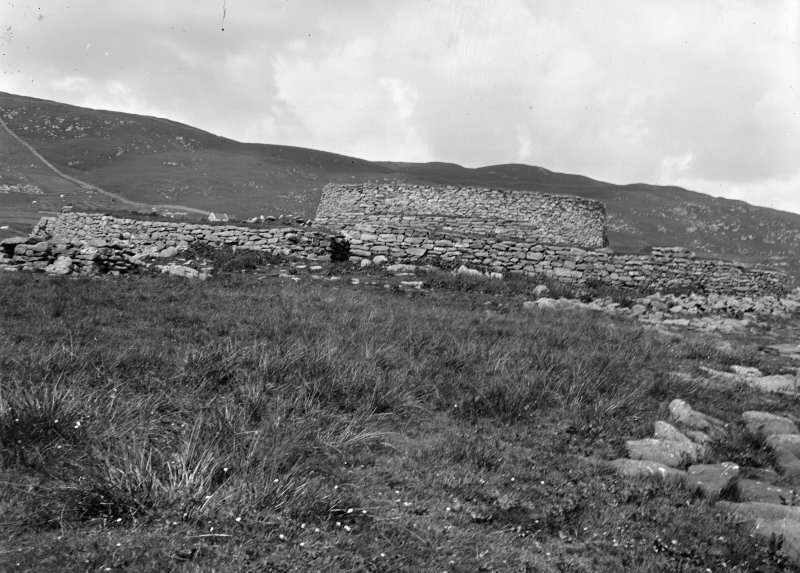 Inner and outer elevations of blockhouse, and four sections. 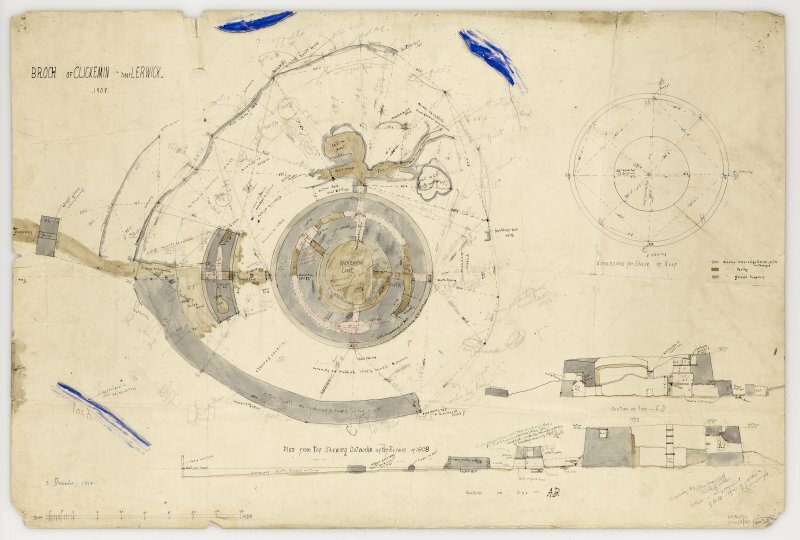 With annotations and measurements. 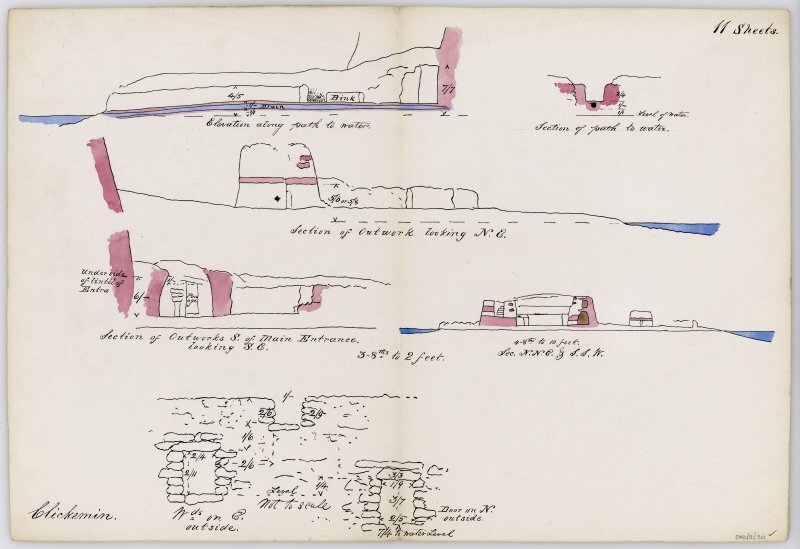 Drawn by Dryden in 1866 and copied by Galloway in 1871. 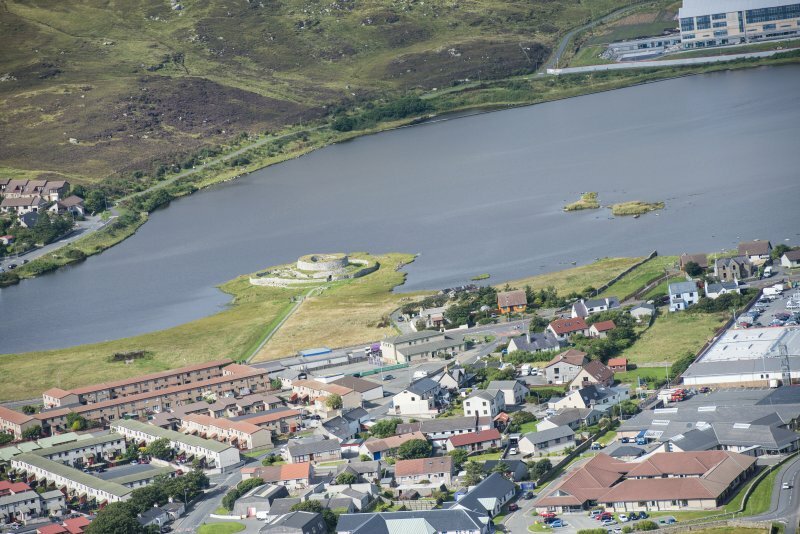 Titled: 'Brough in the Loch of Clickemin. 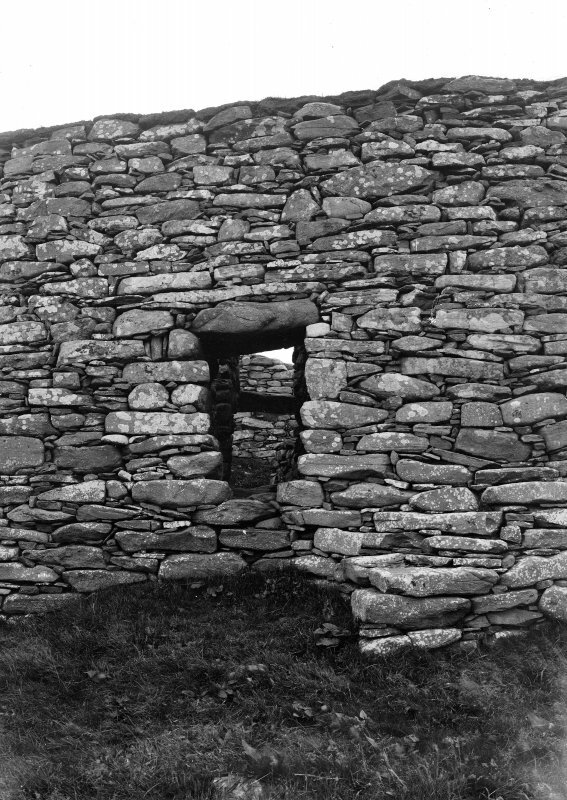 Near Lerwick. 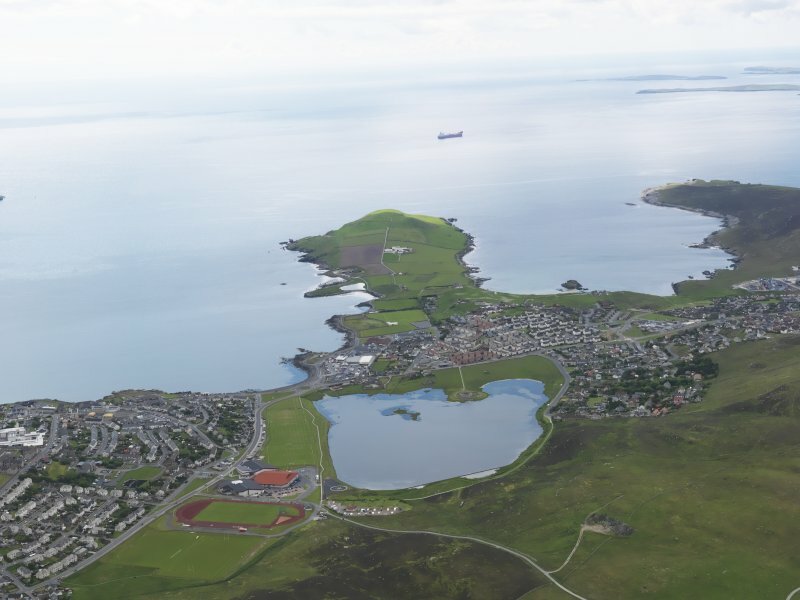 Shetland'. 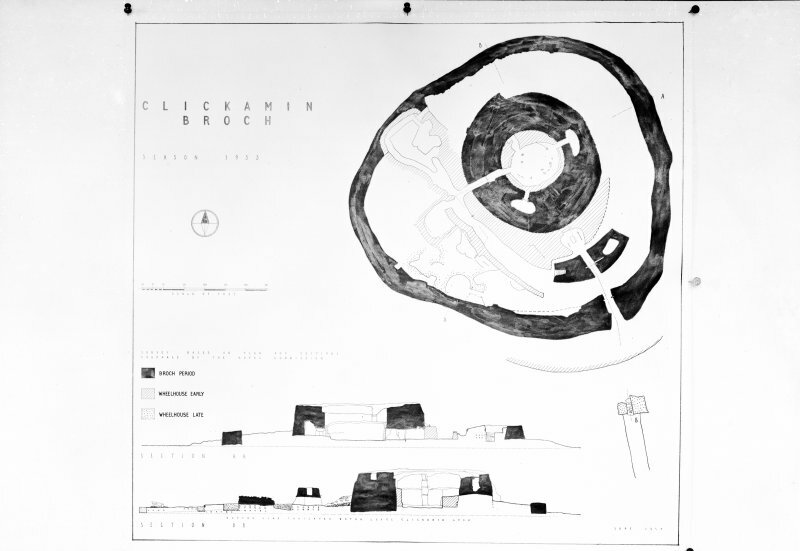 Plan of Clickimin broch. 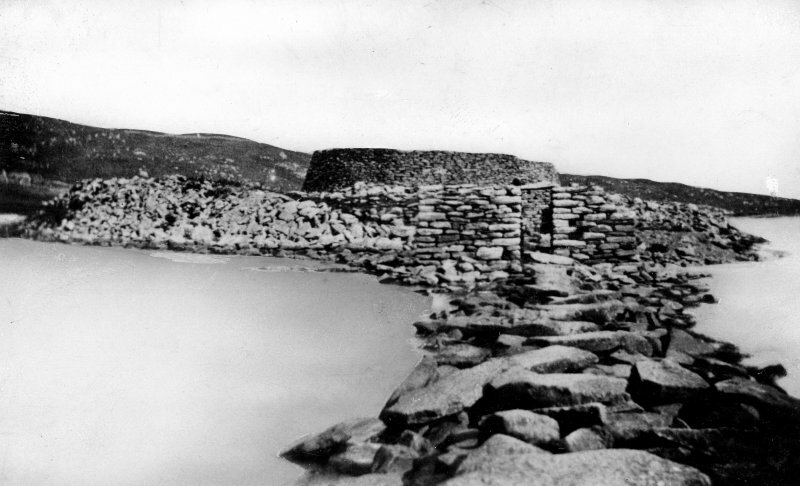 Titled: 'Brough in the Loch of Clickemin, Near Lerwick, Shetland. 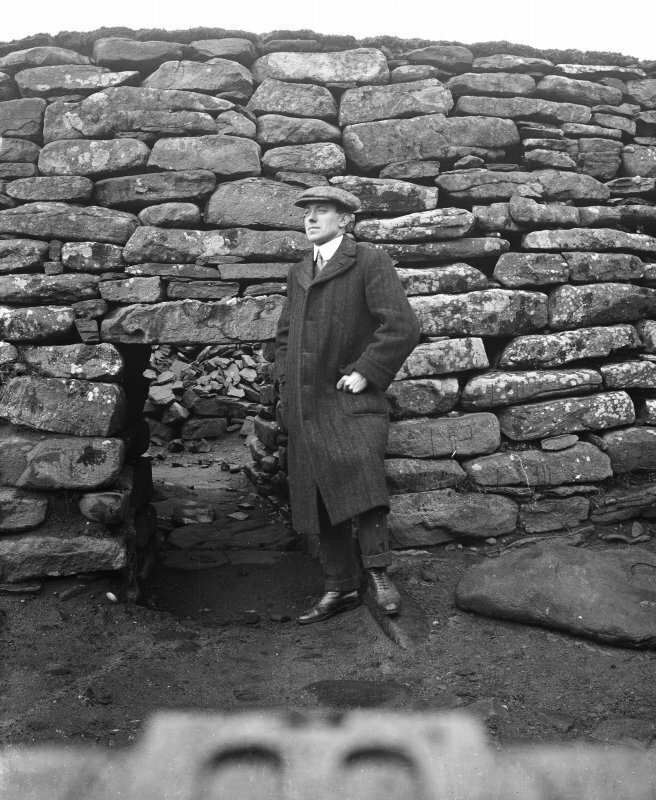 H Dryden 1855-66. 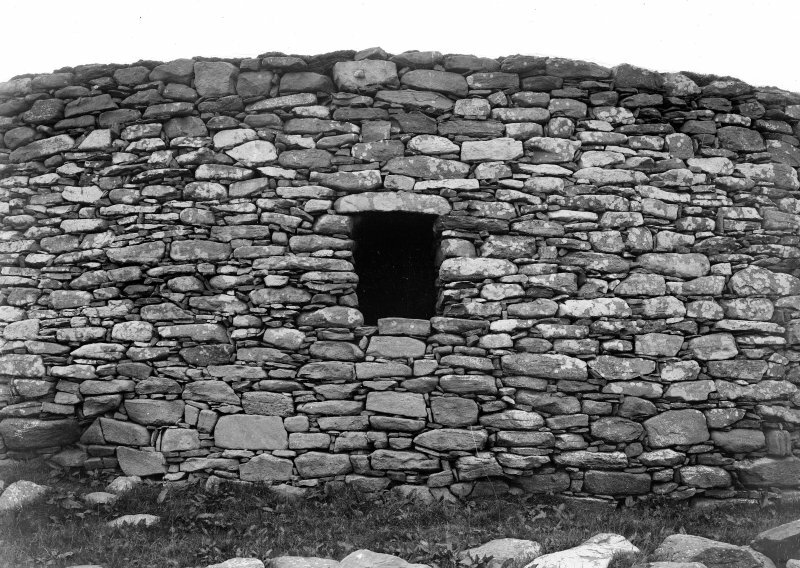 Copied by W Galloway, 1868'. 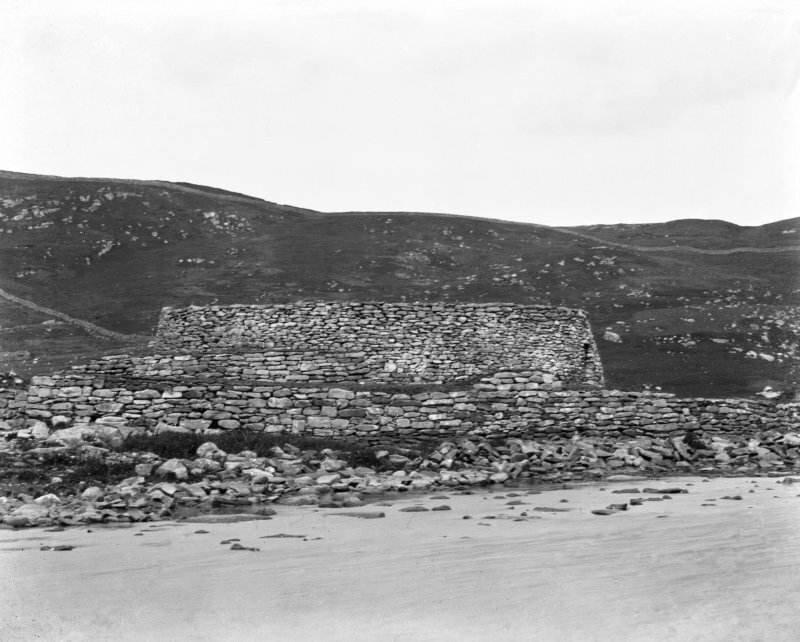 LERWICK, SOUTH ROAD, CLICKIMIN (BROCH, FORT, SETTLEMENT) General view. 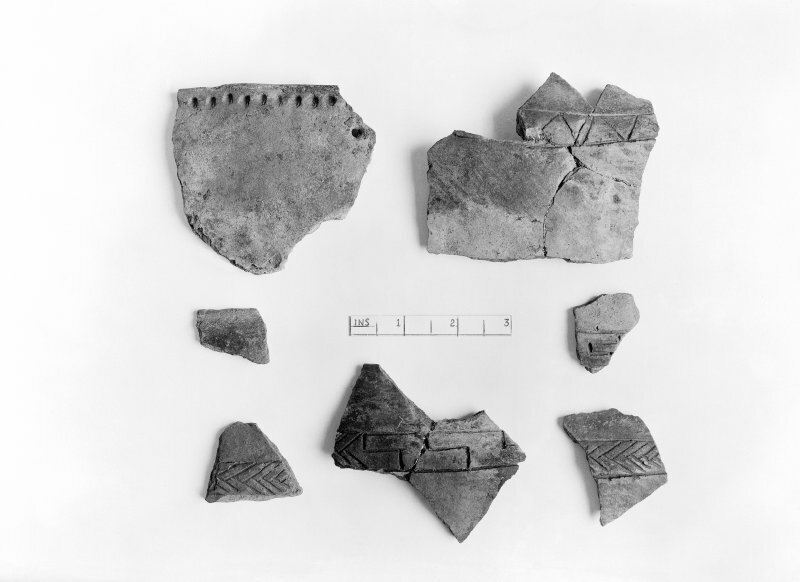 View of pottery sherds from Clickhimin broch excavation. 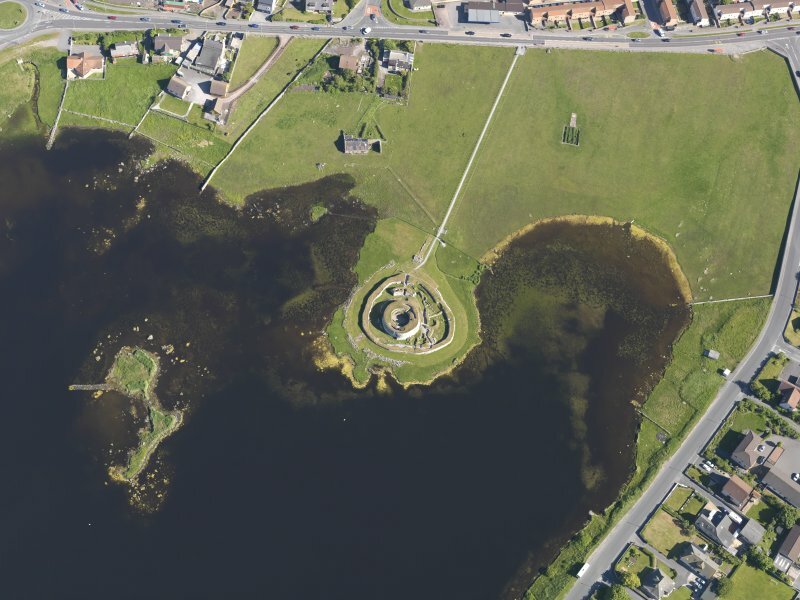 Oblique aerial view centred on the remains of the broch and settlement at Clickhimin, looking S.
Oblique aerial view centred on the remains of the broch and settlement of Clickhimin, looking W.
General view across loch of broch. 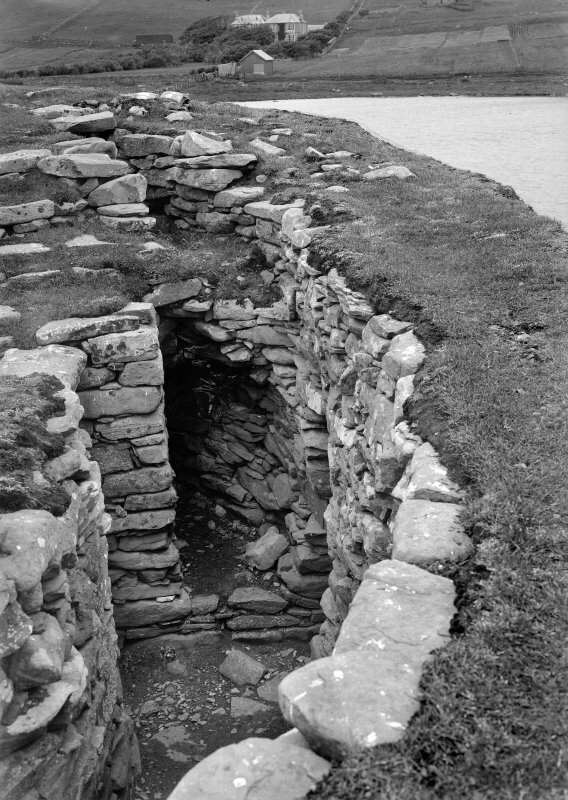 View of the broch interior showing openings in exterior wall. 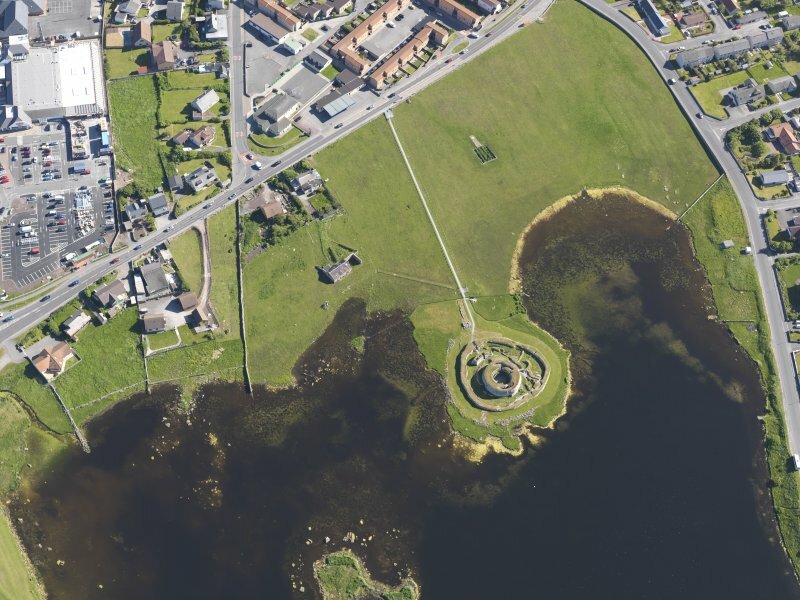 Oblique aerial view centred on the remains of the broch and settlement of Clickhimin, Lerwick. 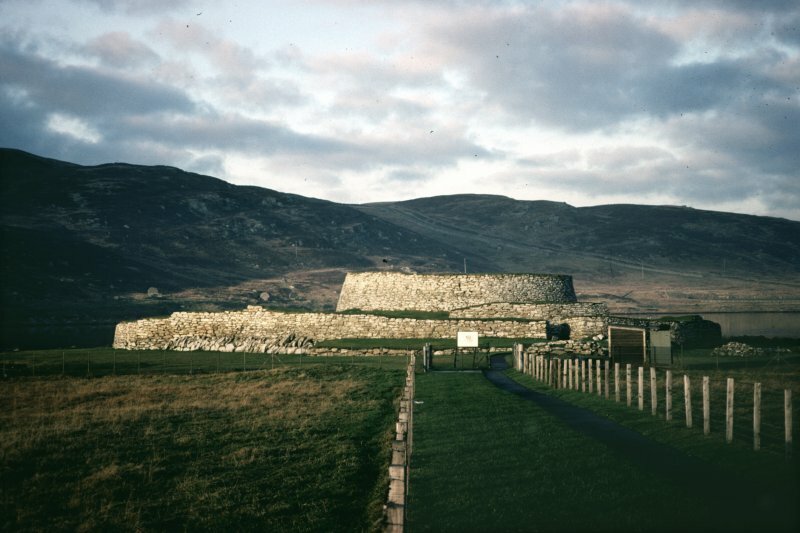 Publication figure; 'Fort and chariotry as compared in epic literature, from Hamilton's 'Iron Age Forts and Epic Literature'. 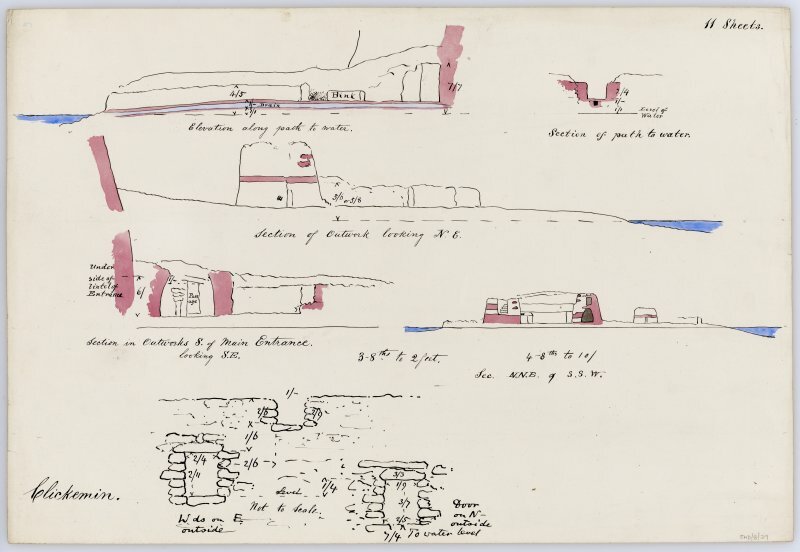 Annotated sketch of Clickimin broch interior. 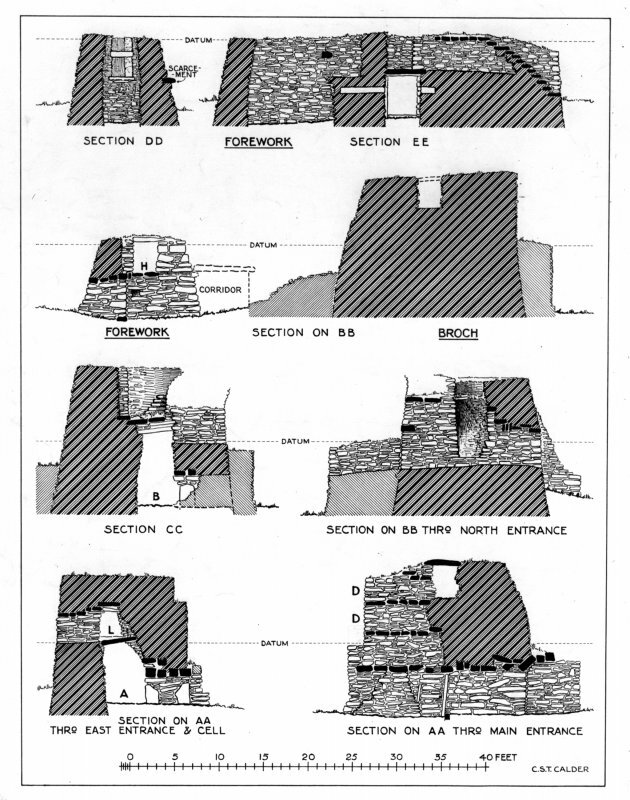 Elevation along and section through 'path to water', ie path through the outbuildings to the NW of Clickimin broch; section through blockhouse looking NE, all at scale of 3/8":2' ; section through the outbuildings S of main entrance looking SE; section though island and structures looking ESE, at scale of 1/2":10'; details of wall exterior, not to scale. All with annotations and measurements. Unsigned and undated. 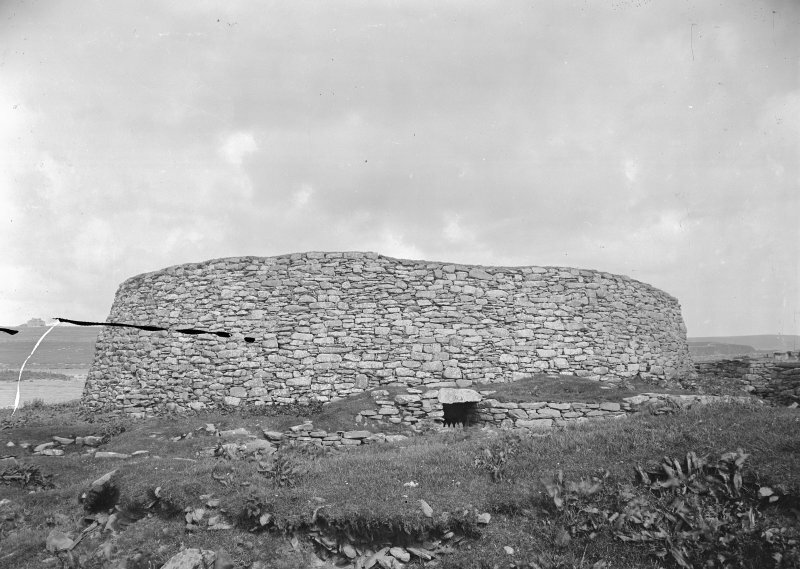 Plan of Clickimin broch at top level, with annotations and measurements. 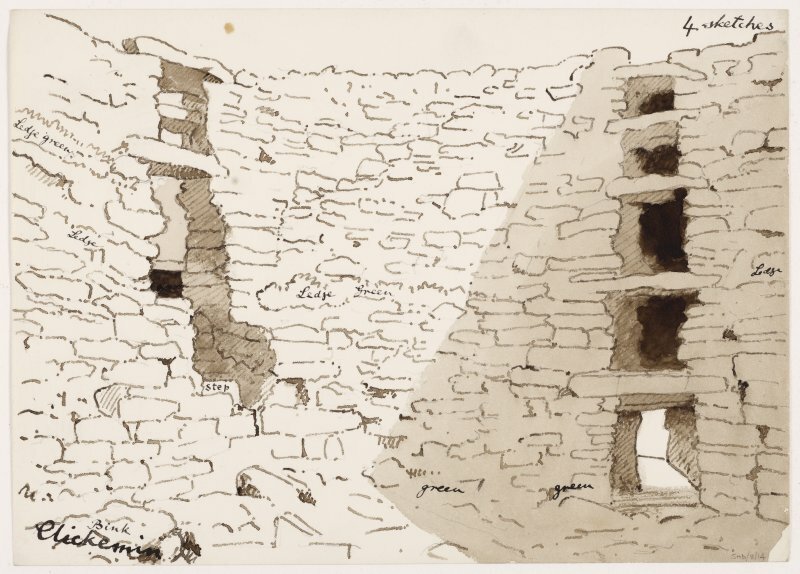 Drawn by Dryden in 1866 and copied by Galloway in 1868. 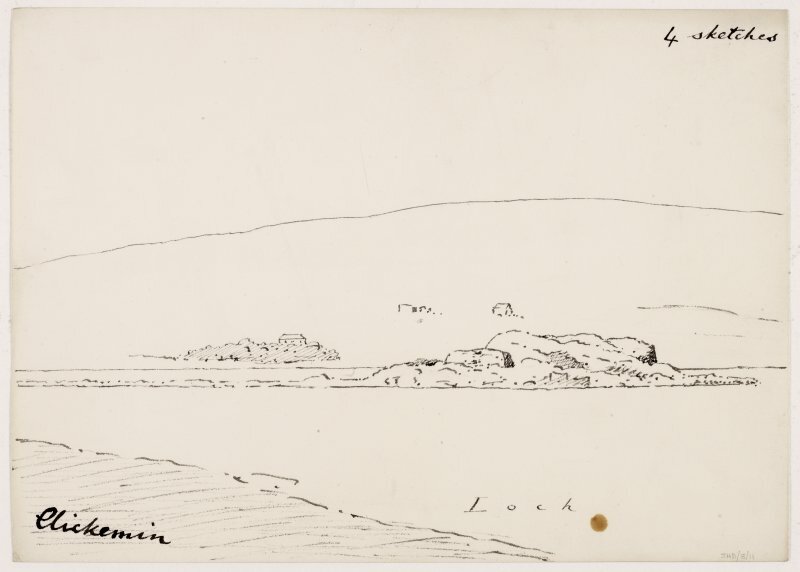 Titled: 'Brough in the Loch of Clickemin. 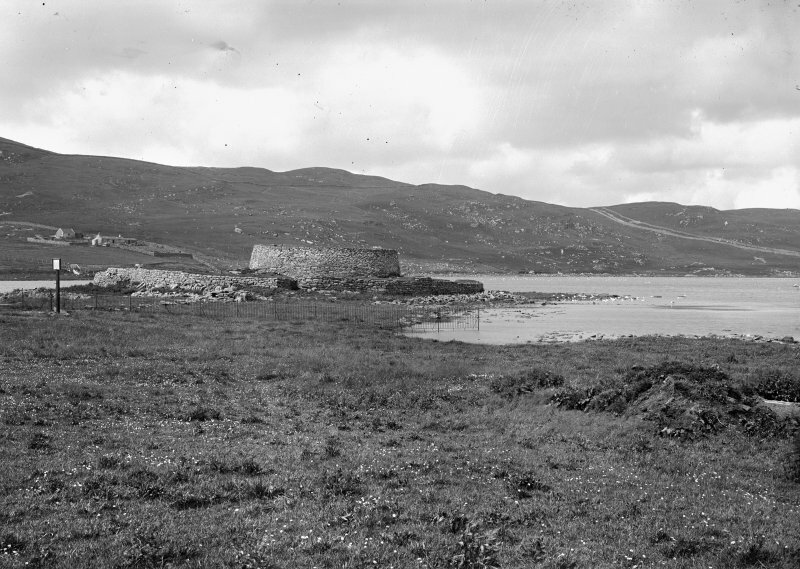 Near Lerwick. 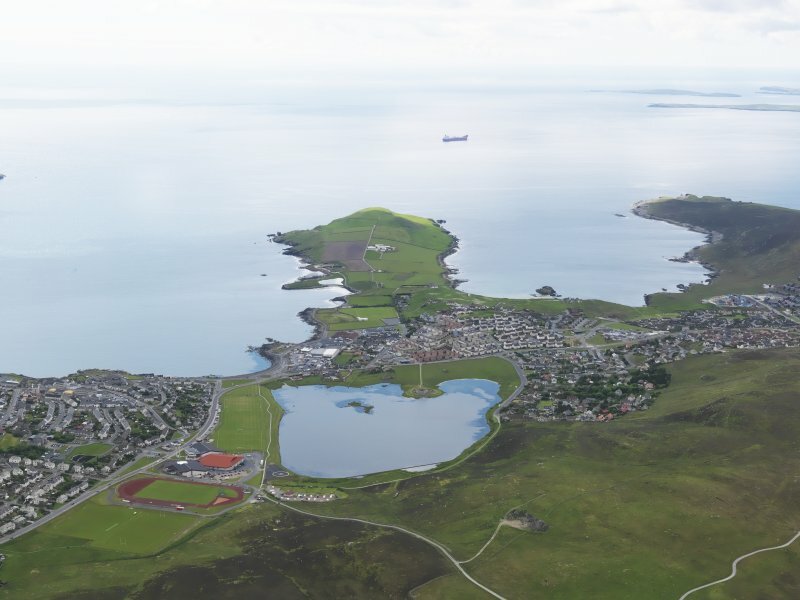 Shetland'. 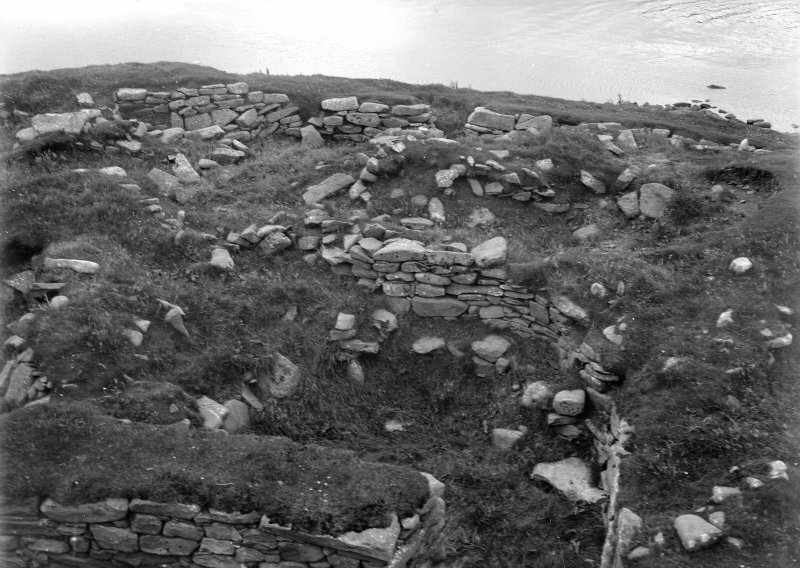 LERWICK, SOUTH ROAD, CLICKIMIN (BROCH, FORT, SETTLEMENT) View of site prior to excavations and reconstruction. 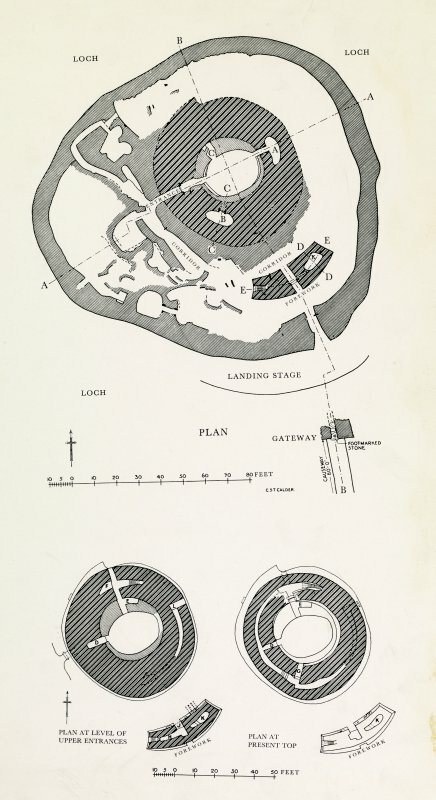 Plan at ground level. 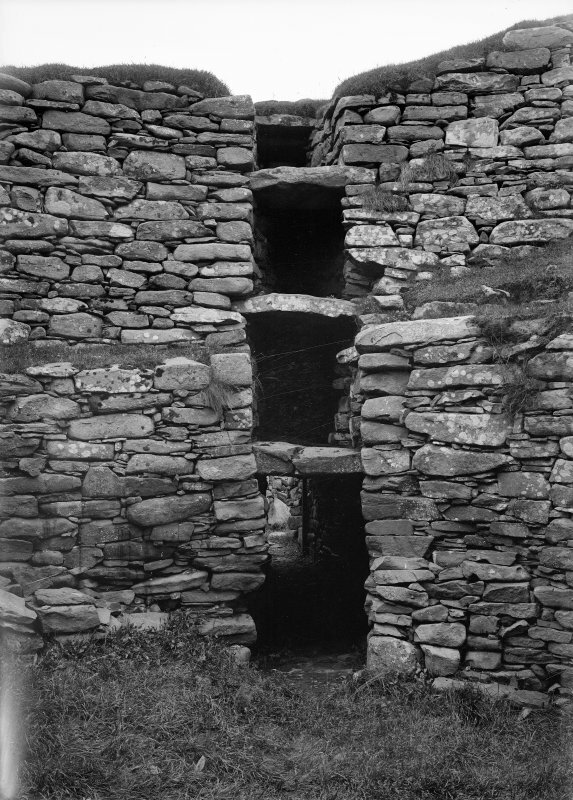 From RCAHMS Inventory of Shetland, fig.557. 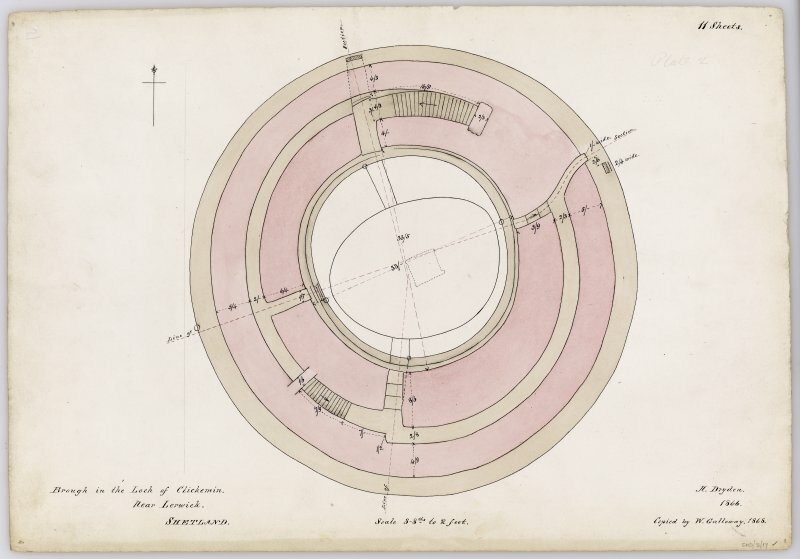 Survey drawing; plan of Clickhimin broch, with reduction and details. 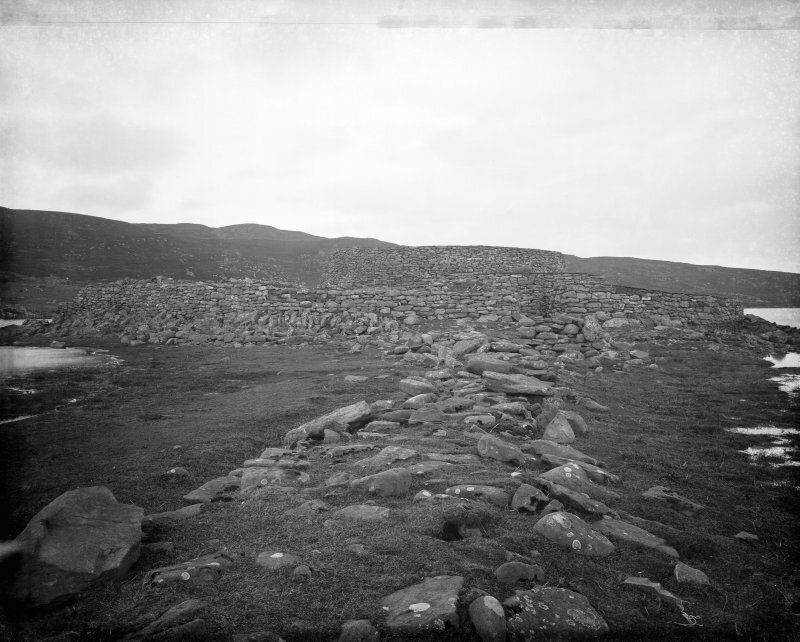 Present location: set as a paving stone in the outer gateway leading into the fort with the footprints facing upwards. 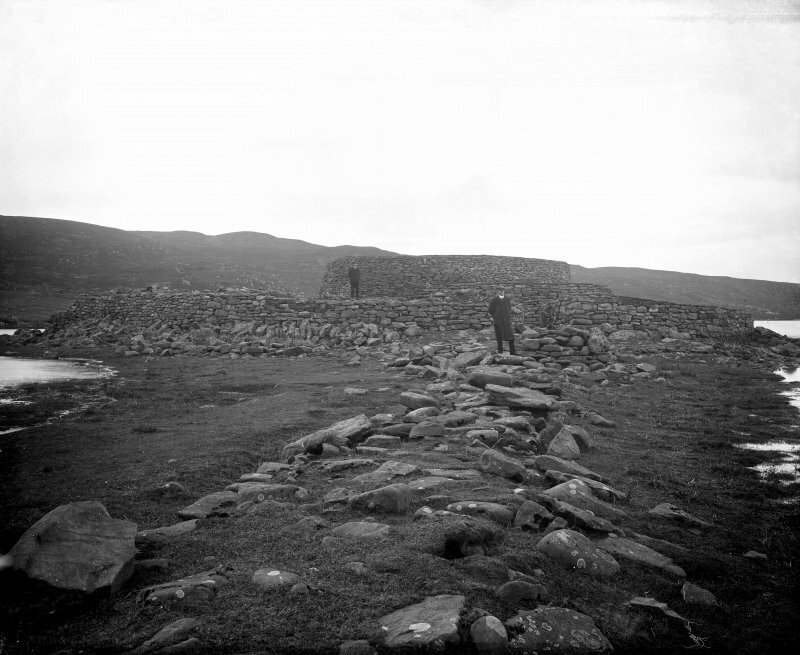 Evidence for discovery: none, and the slab is unlikely to be in its original location. Carved in low relief into the surface of the slab is a pair of shod footprints, set close together roughly in the centre of the slab. Each footprint is 0.23m long (9 inches). References: Hamilton 1968, 151-6; Scott & Ritchie 2009, 2, 14, 47, no 10. 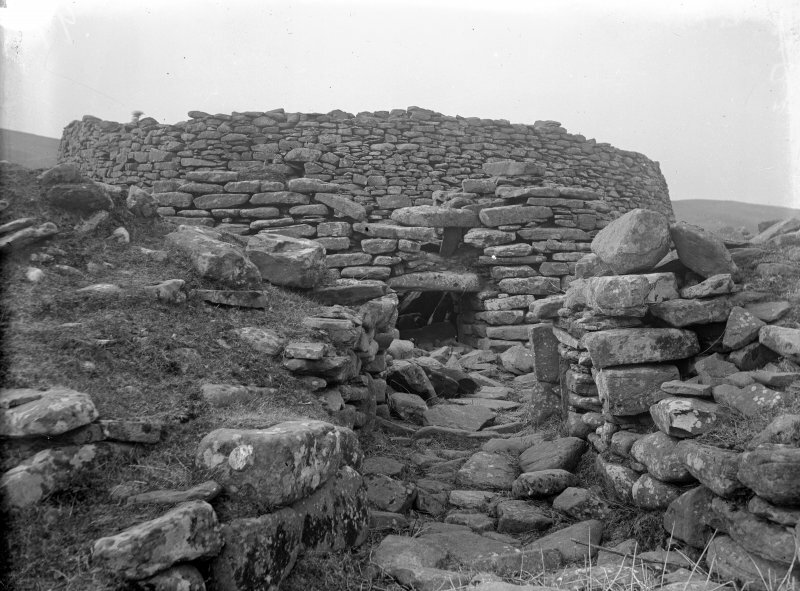 The broch of Clickhimin, one of the best preserved broch sites in Shetland, was excavated between 1953 and 1957 by Hamilton, who recovered a history which shed new light on the Iron Age colonization of the area. 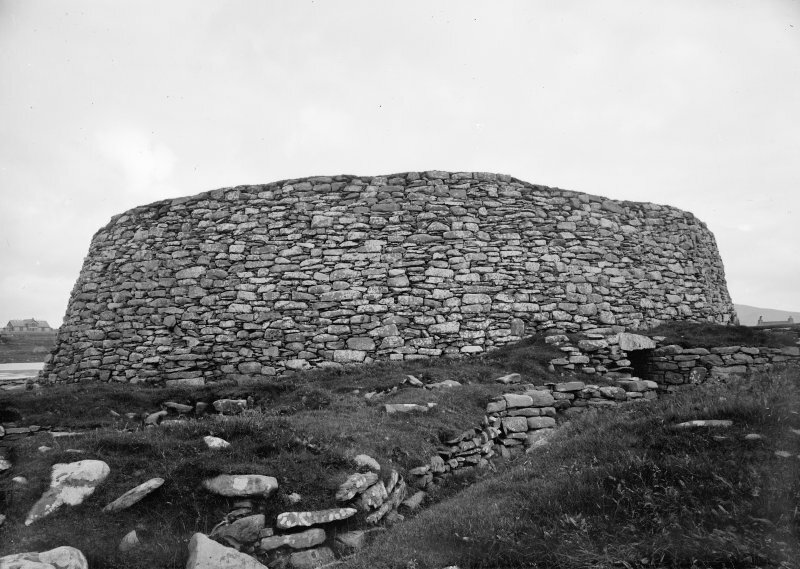 The earliest occupation of the site was a small Late Bronze Age farmstead of the 7th or 6th centuries BC which was superseded by a larger circular farmhouse built by Iron Age immigrants about the 5th century BC. 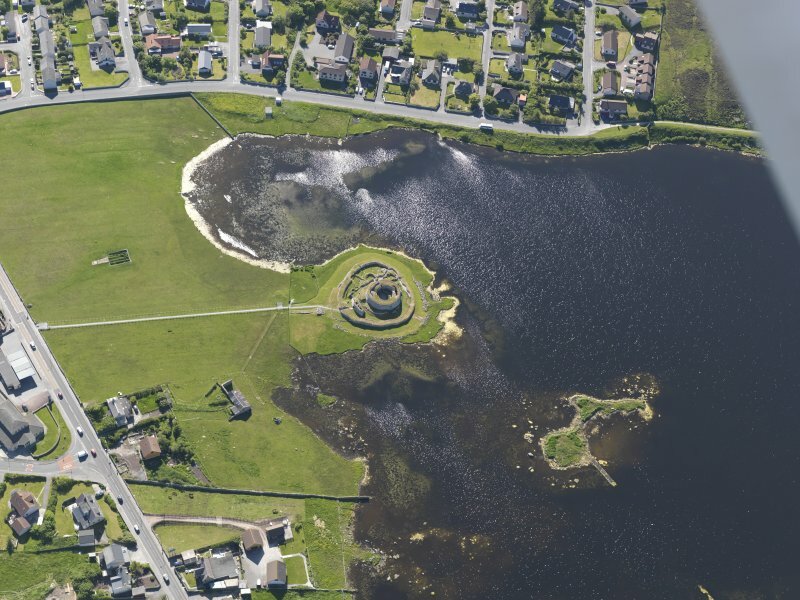 In the 4th, or early 3rd century BC larger and well-organised bands of Celtic settlers arrived, capable of erecting a stone-walled fort consisting of a block-house and ringwork, which was in turn superseded by a broch about the 1st century AD. 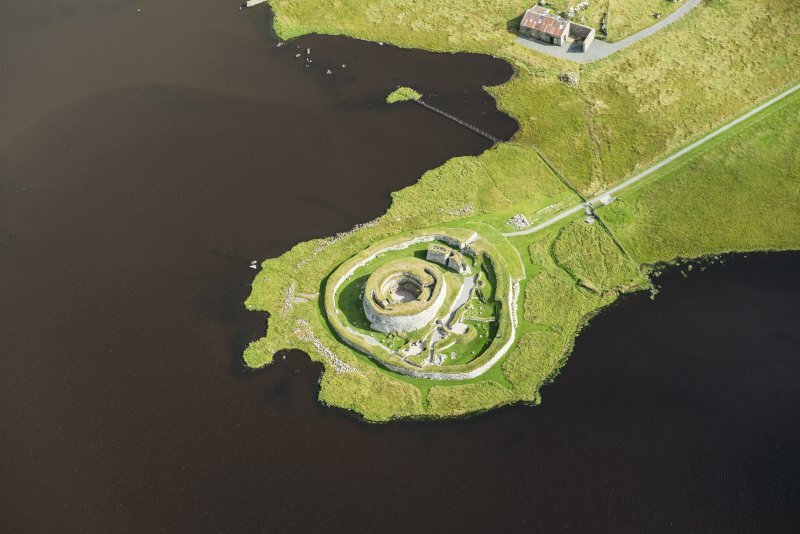 In the 2nd and 3rd centuries AD the need for such defences passed away and the subsequent history of the site centres round a large wheelhouse built within the reduced tower and with minor outhouses, storage pits and cattle stalls dug in the debris inside the older defences. 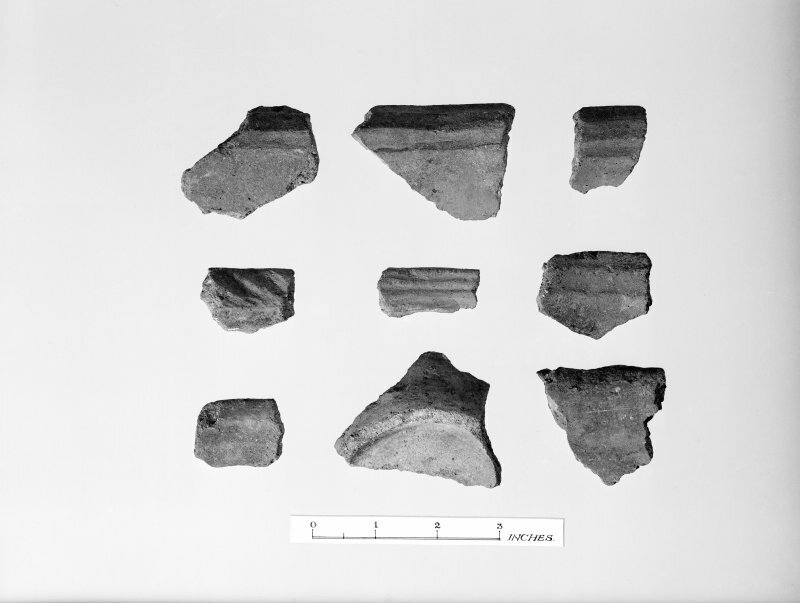 310: Two fragments of Roman glass were found, one 1st to early 2nd century AD and the other 2nd to mid-3rd century. 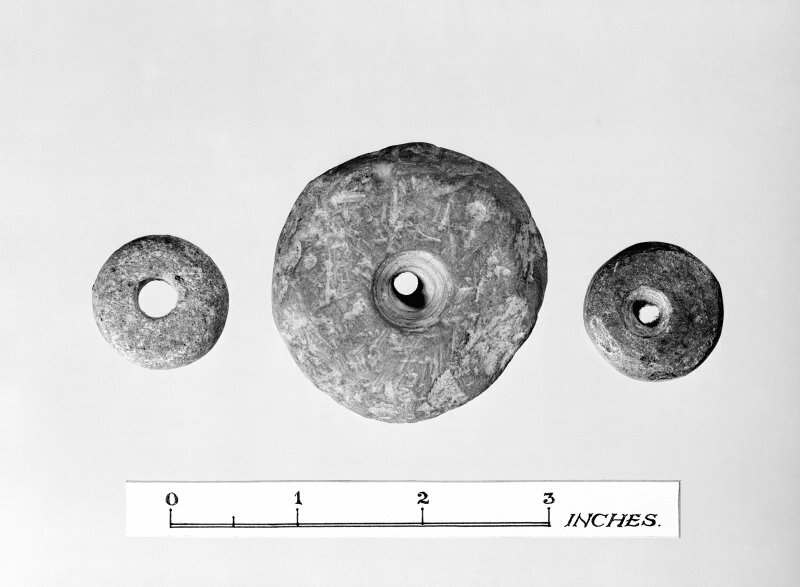 Both came from wheelhouse deposits. 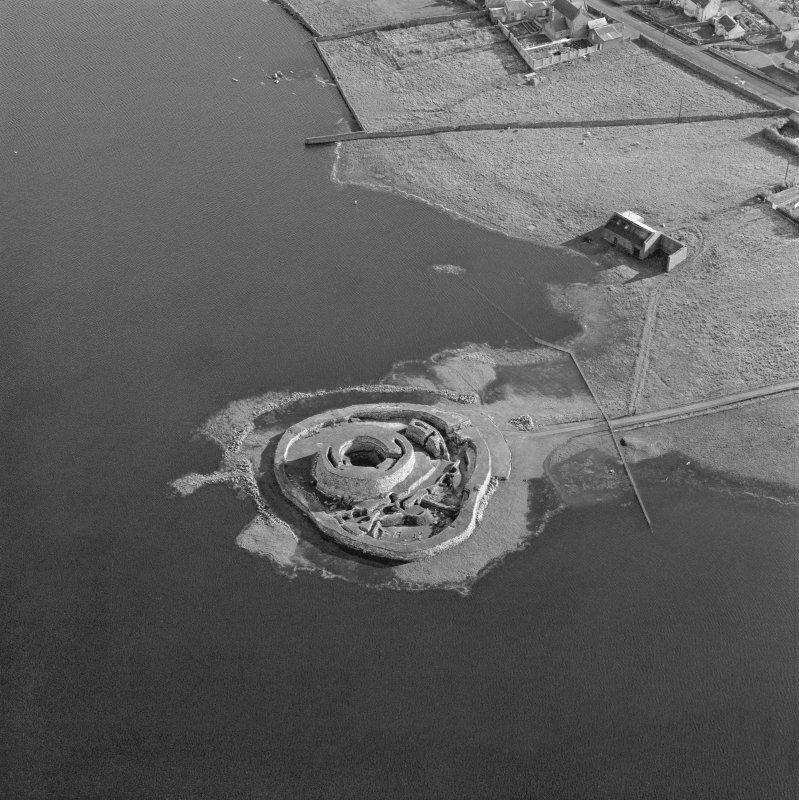 Resurveyed at 1/2500 by OS(RD) 8th September 1964. 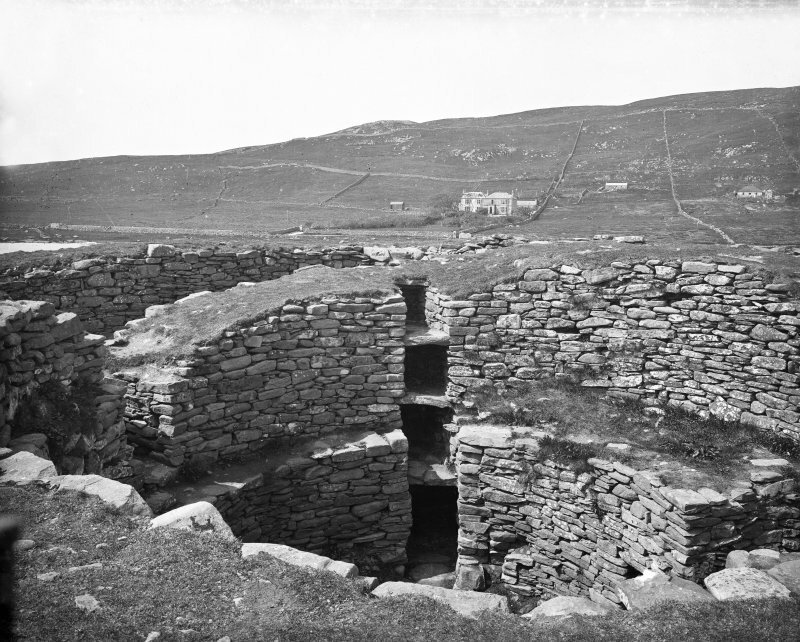 Clickhimin Broch is situated on the south shore of the Loch of Clickhimin, three-quarters of a mile south-west of Lerwick on the Lerwick-Sumburgh road. 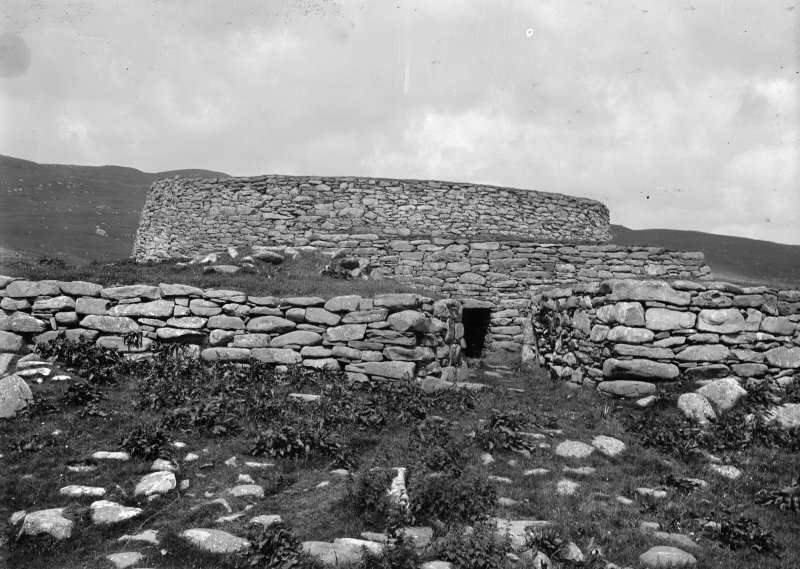 Mousa Broch is situated on the west shore of the island of Mousa, opposite Sandwick, 15 miles south of Lerwick on the Lerwick-Sumburgh road. Access is by motor boat hired from Leebatten, Sandwick. 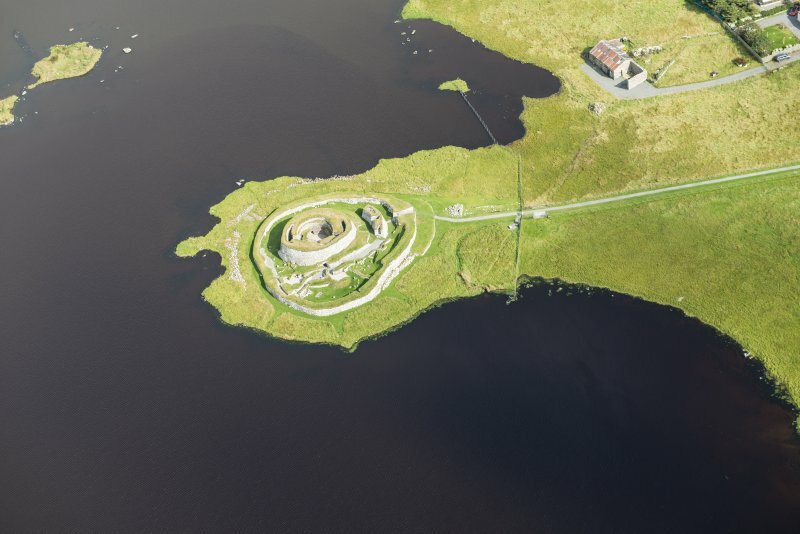 These two monuments are open at all reasonable times on application to the Caretaker. 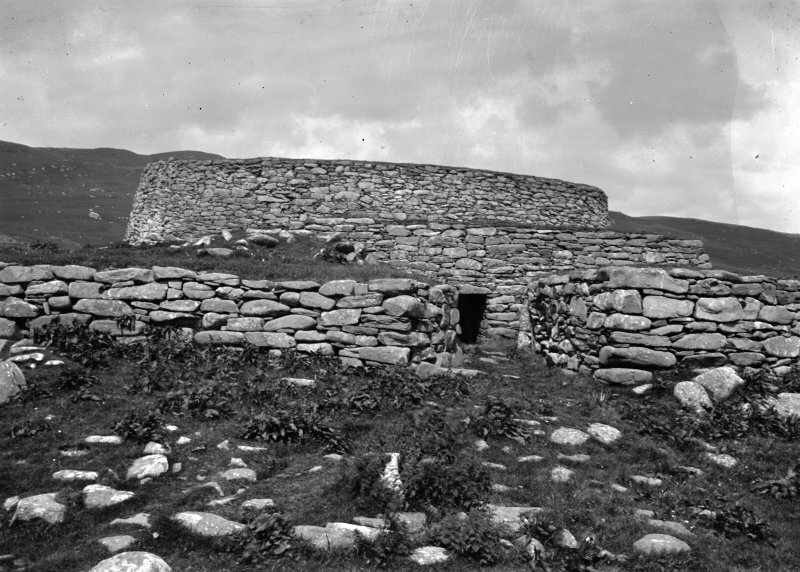 The device on the outside of the cover is a stylised picture of a broch. D V Clarke 1970; E J Mackie 1971. 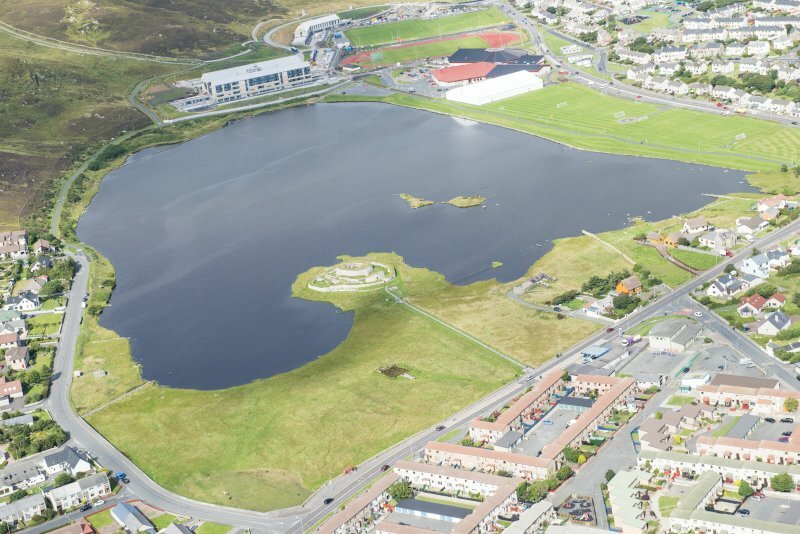 A watching brief was carried out in advance of cables being laid for the installation of floodlights at Clickimin Broch. 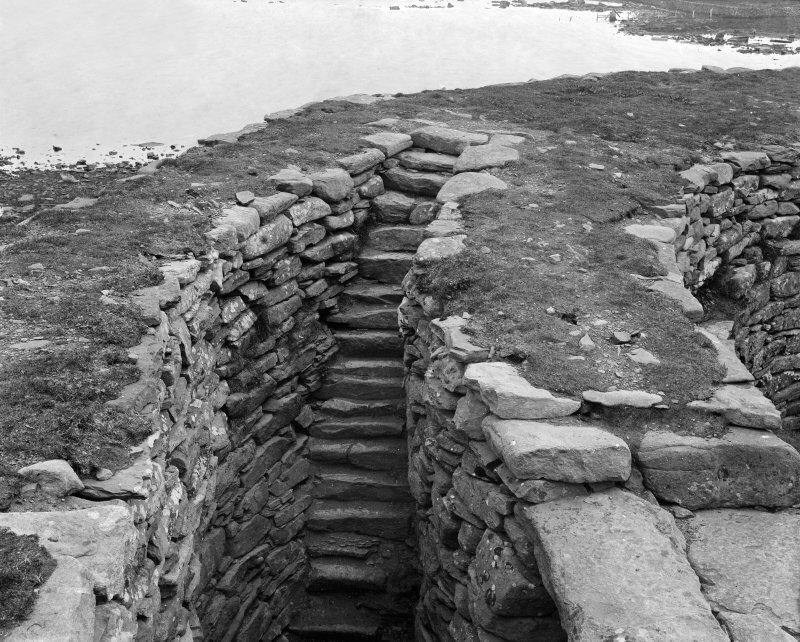 The trenches were dug by HBM workmen. 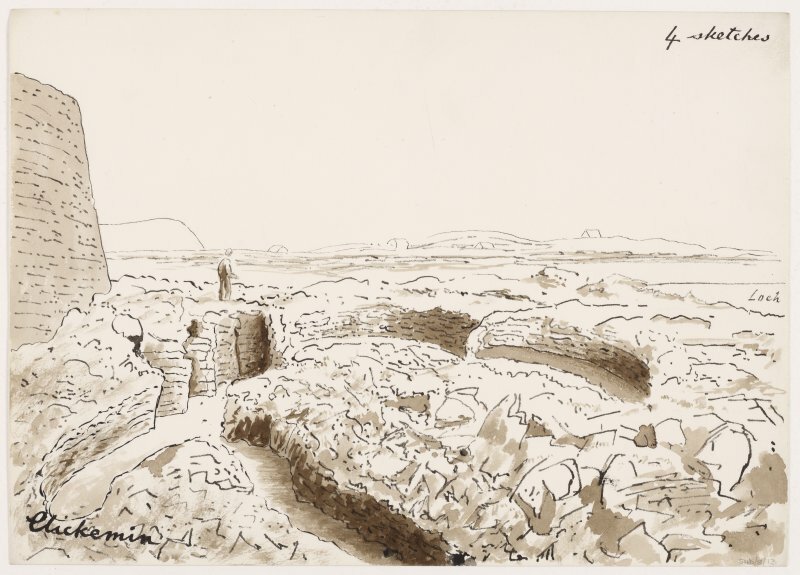 The trenches averaged 0.2m wide and rarely exceeded 0.15m in depth. 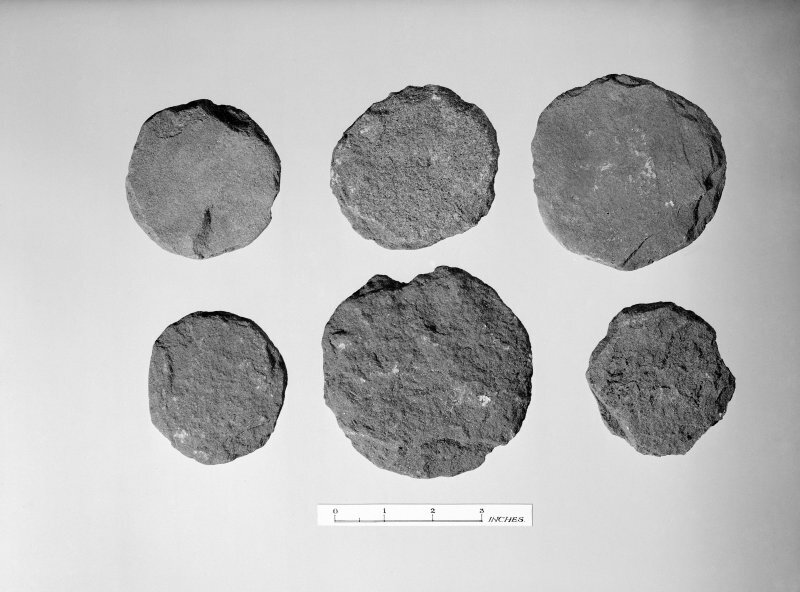 The nature of the disturbed deposits was recorded. 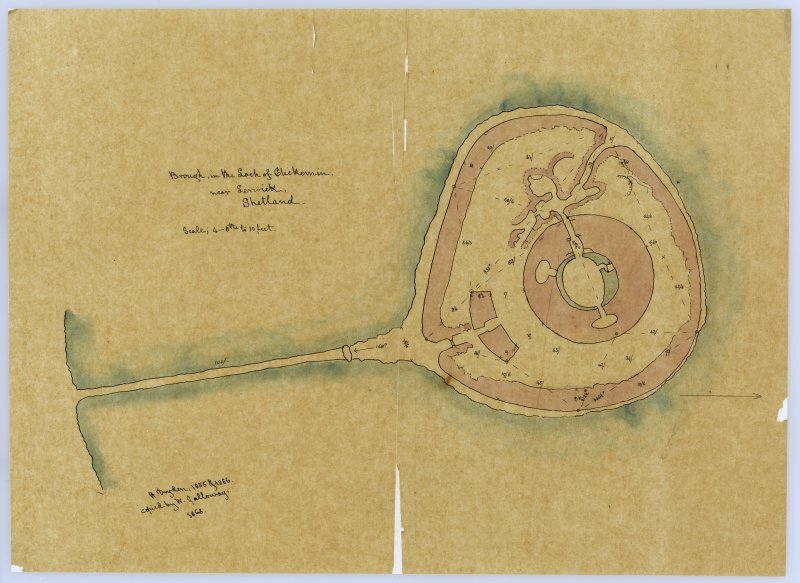 Copies of the report have been deposited with RCAHMS, HBM, and the Shetland Archives. 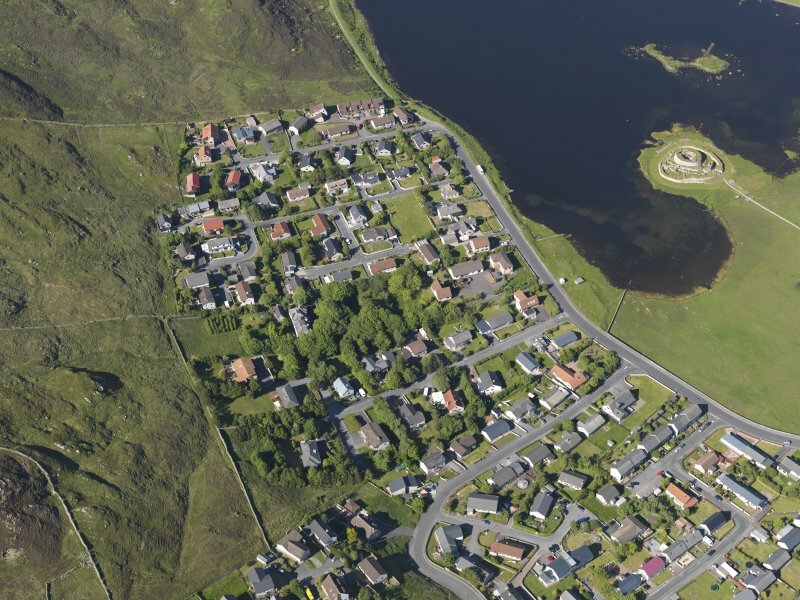 Three oblique aerial photographs of Clickhimin, Shetland, taken by Mr John Dewar in 1971.